Daybed designed by Says Who in fabric Walton color dark grey, black frame, L176 x W66 x H96 cm. 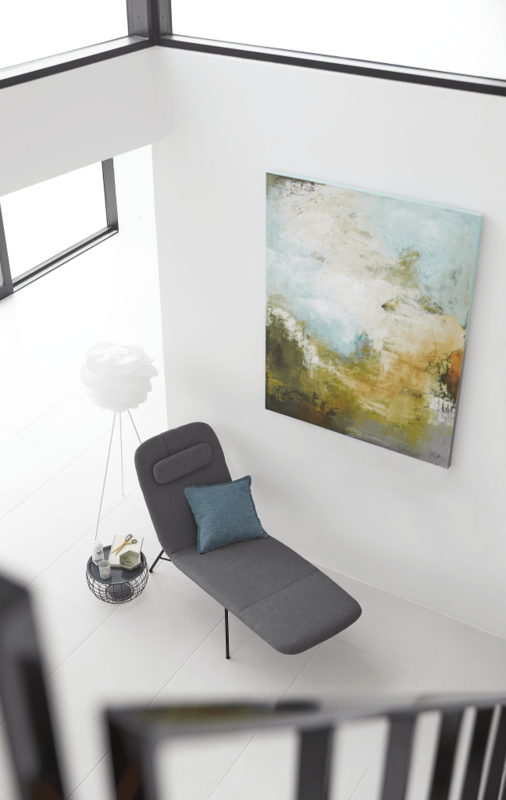 NEW WAVE 3 original painting, W90 x H120 cm. CARMINA floor lamp with tripod base in white metal. 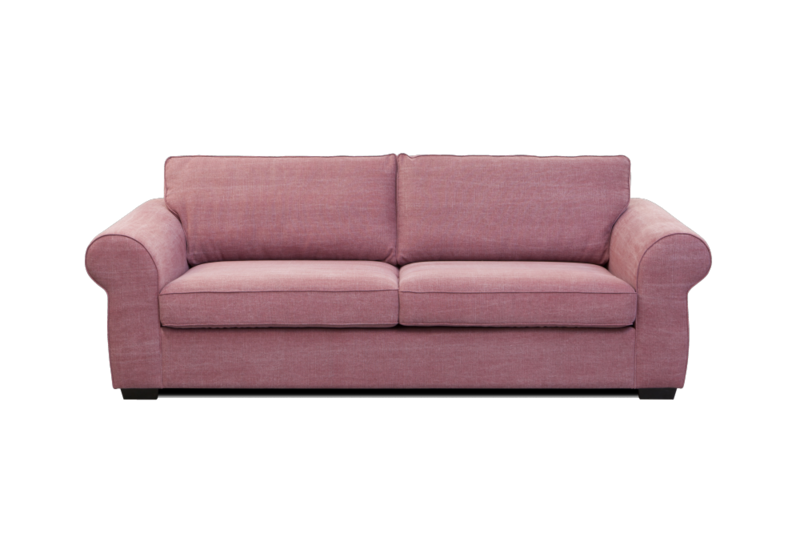 3 Seater sofa in Devine fabric in color Pink, designed by Ian Archer, L214 x W101 x H84 cm. MICO tray table with wooden white lacquered table top and base in metal lacquered white, D51 x H62,5 cm. VOLGA desk in lacquered pure white, designed by Nádia Soares, L90 x W60 x H88 cm. 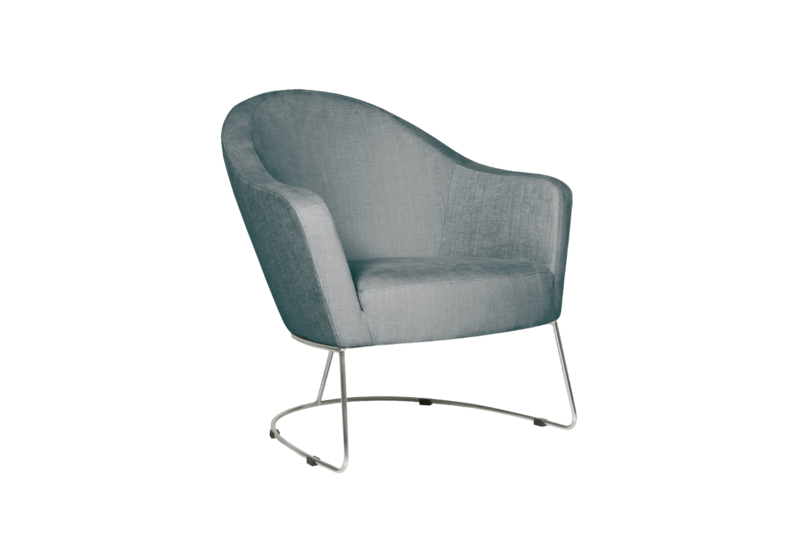 Swirvel chair in Super velvet color grey, D77 x W72 x H89 cm. 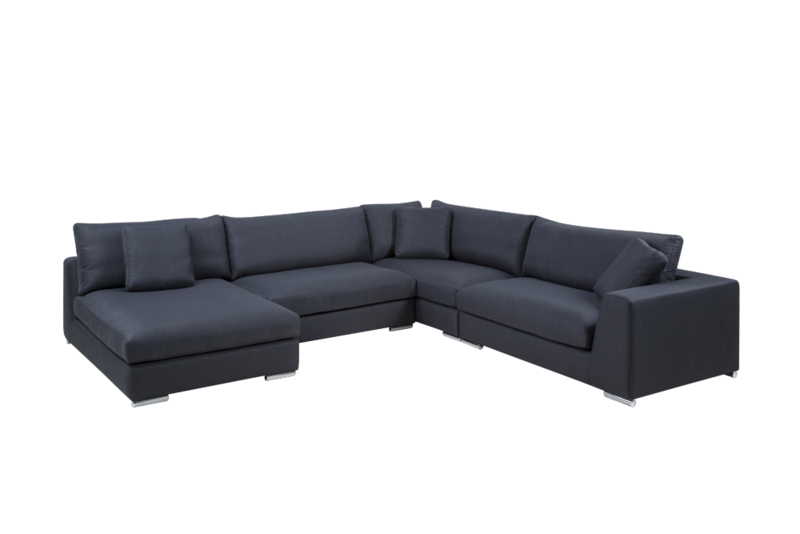 Modular system sofa in Vila Ice blue and steel legs, L238 x W430 x H79 cm. Shaggy rug in 100 % polyester, L240 x W170 cm. 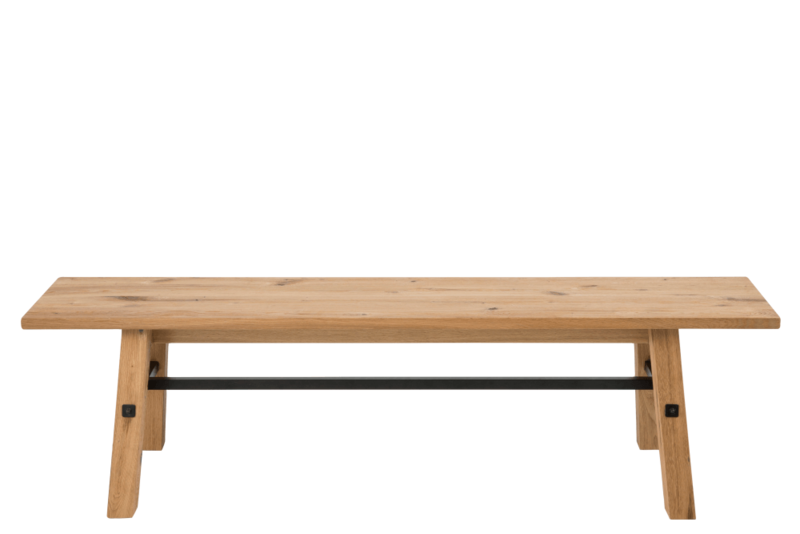 SM 207 EDS coffee table in lacquered smoked oak, designed by Per Hånsbæk, L65 x W63 x H47 cm. 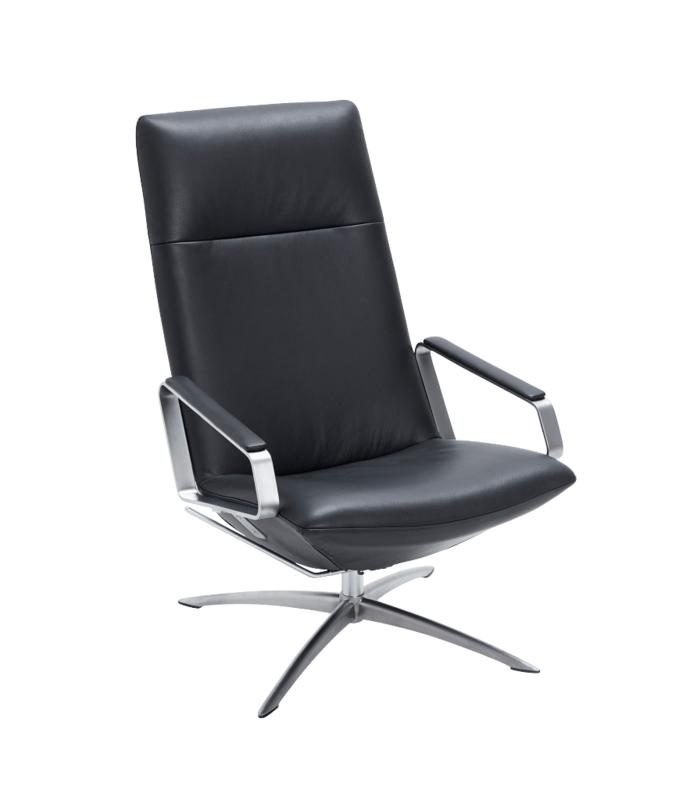 EASTWAY chair in cat 6 leather color 4451 brown, L68 x W84 x H79 cm. 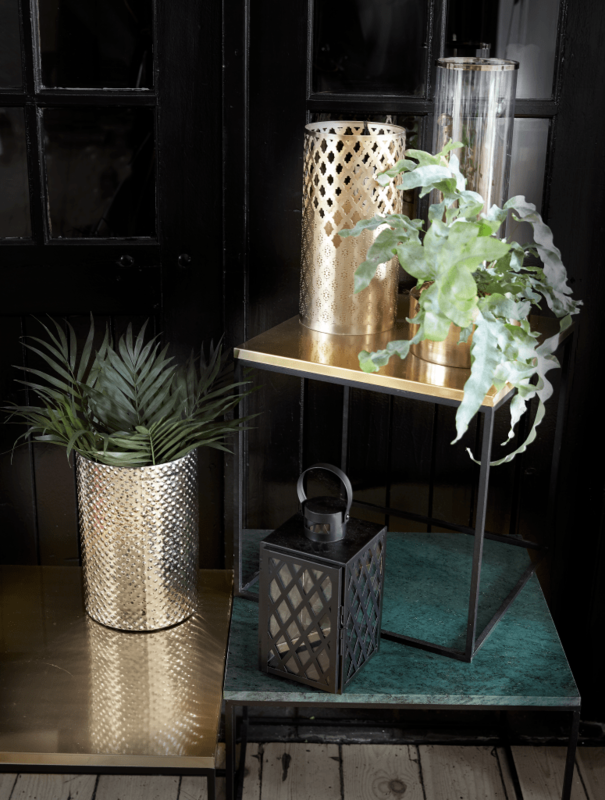 GEOMETRIC table lamp in brass and light grey metal. 2 Seater sofa in Milan nature, with chrome legs L285 x W103 x H83 cm. 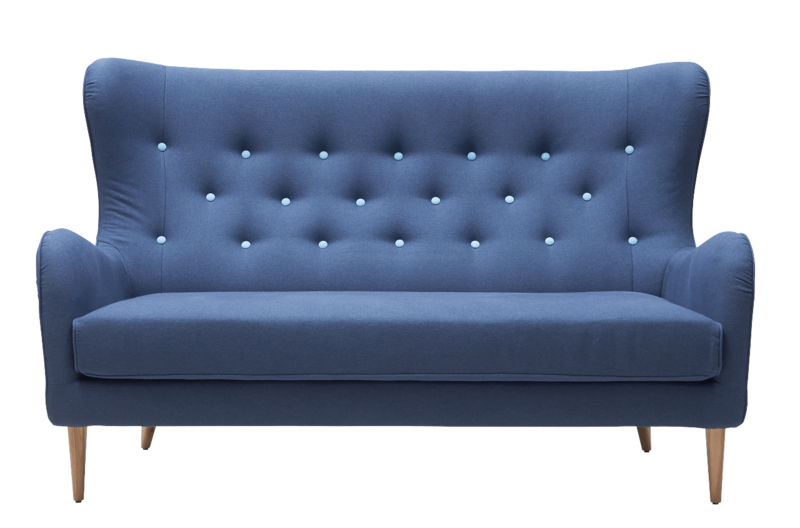 2,5 Seater sofa in Luis fabric with buttons, L164 x W98 x H102 cm. 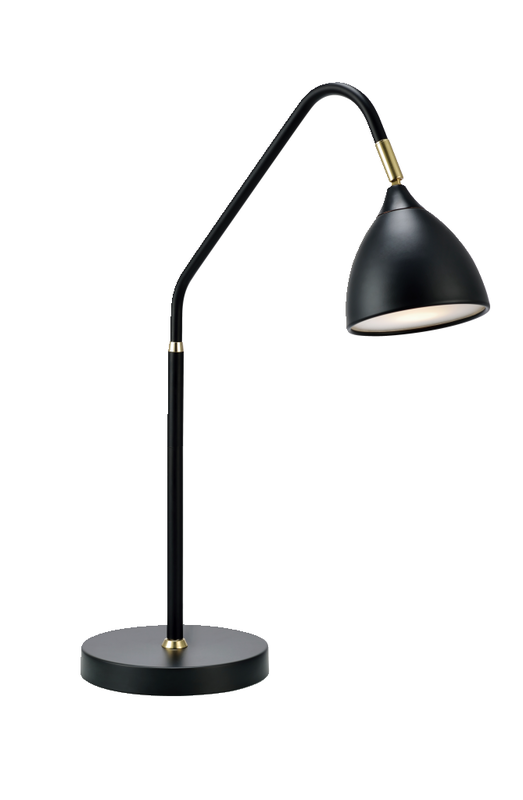 Table lamp in brass and black shade with inside in gold, H54 cm. 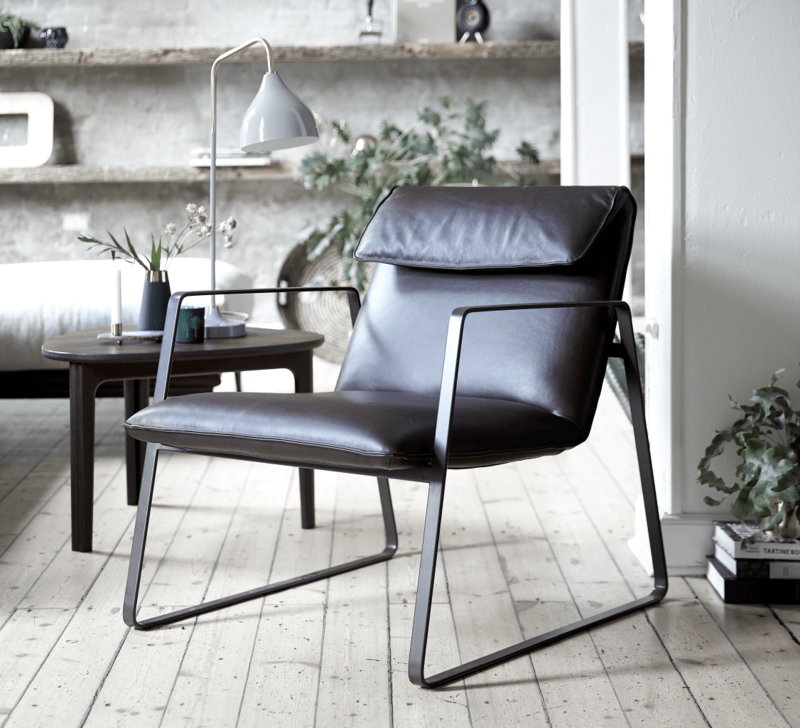 SM69ED Lounge chair in smoked oak and Nougat 4049 leather, designed by Per Hånsbæk, L56 x W50 x H79 cm. 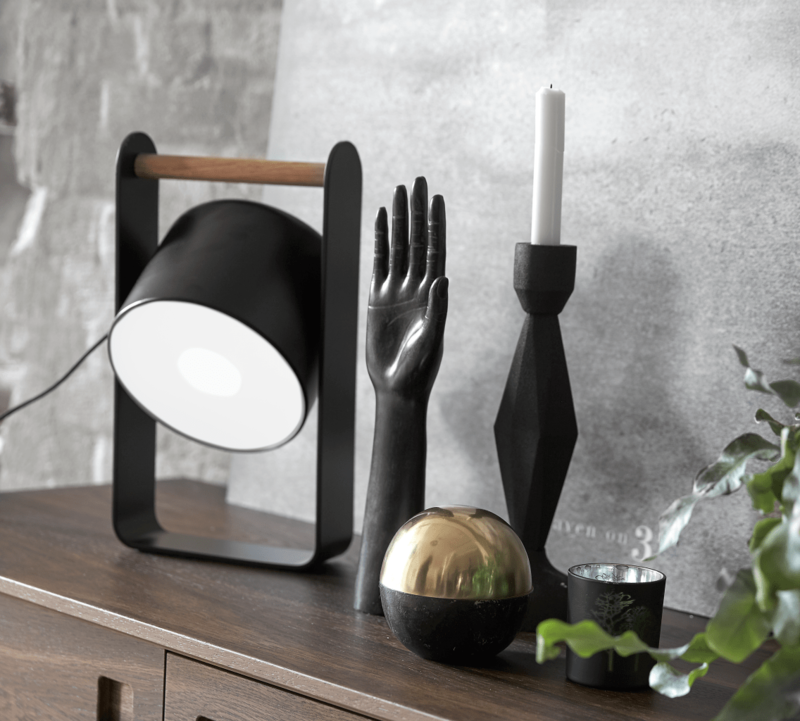 Table lamp in black metal and polished brass. 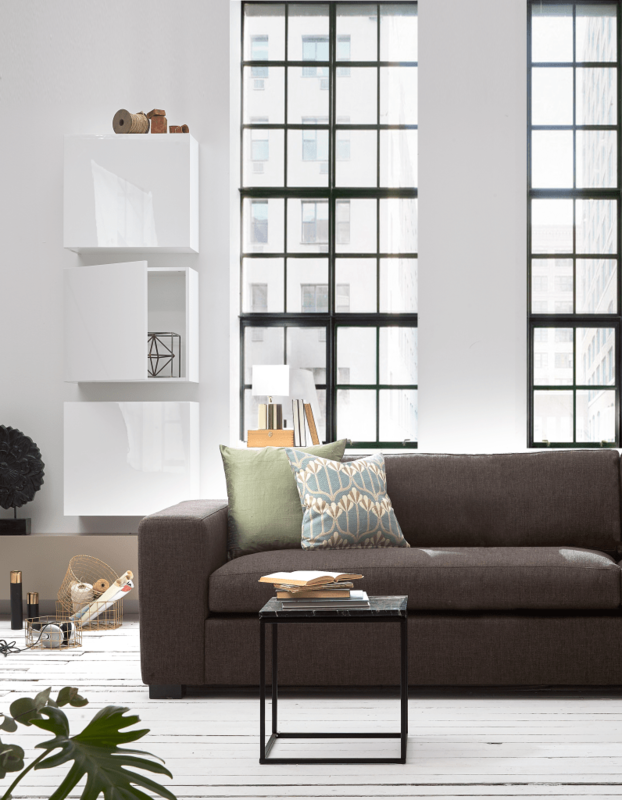 Corner sofa in Portland antrazit 96, L241 x W261 x H84 cm. 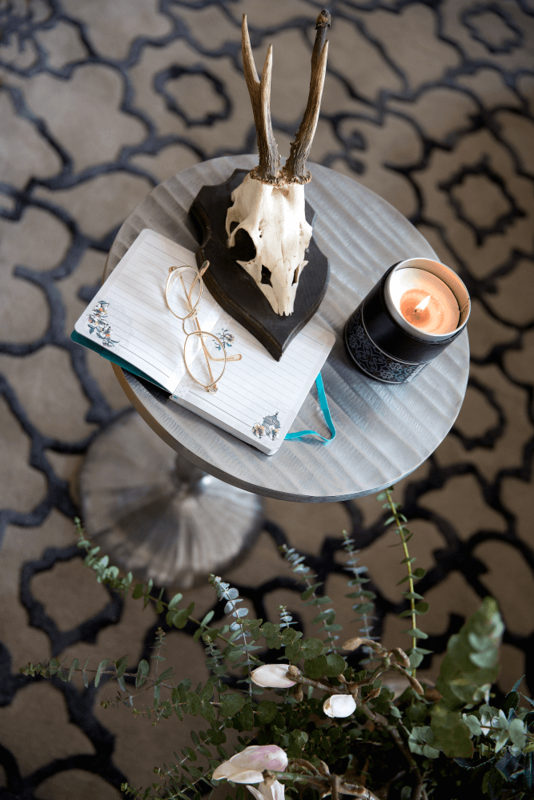 C-BAR coffee table with trumpet foot in color black, D60 x H40 cm. 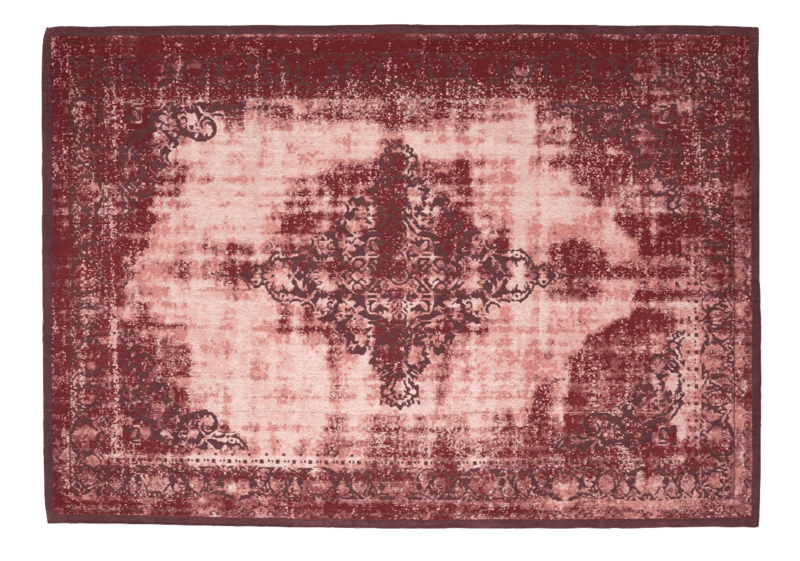 LUCENS rug in 100% viscose, old rose, L240 x W170 cm. HUSBY table lamp with 5 light bulbs and base in cement, H34 cm. 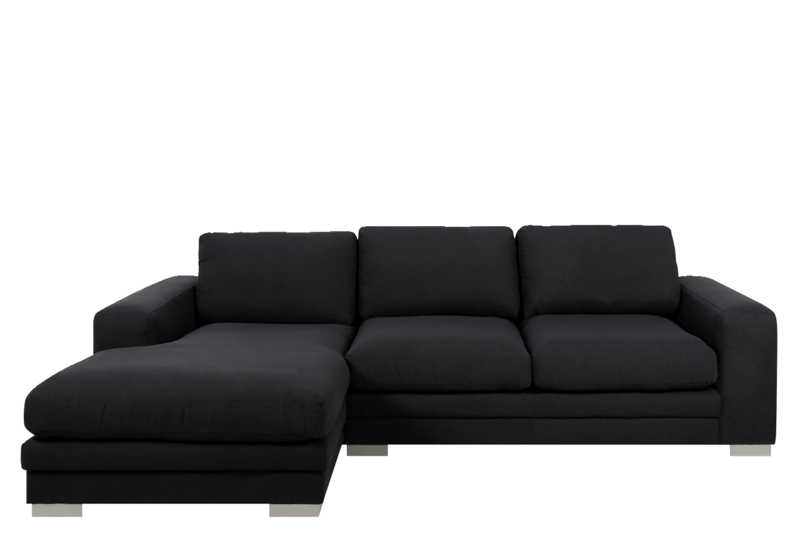 3 seater sofa in dark grey velvet, black legs, designed by Dan Ihreborn,L231 x W86 x H81 cm. 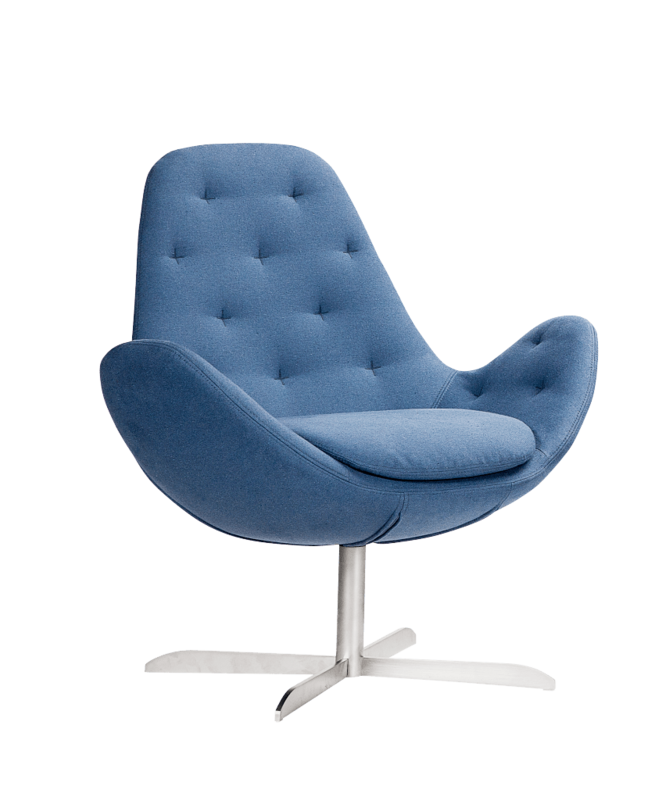 JULIA recliner in Brest fabric color 119 minth, with black legs, designed by Dan Ihreborn, L70 x W78 x H81 cm. COFFEE TABLE 60, in white marble and black base, designed by Emil Thorup, L62 x W62 x H43 cm. 3 Seater sofa, king size, in Siena fabric, L290 x W100 x H80 cm. 3 seater sofa in Joker fabric, color oyster 798/05, L242 x W107 x H70 cm. 3 seater sofa in Classic velvet color green, with black legs, L271 x W126 x H80 cm. 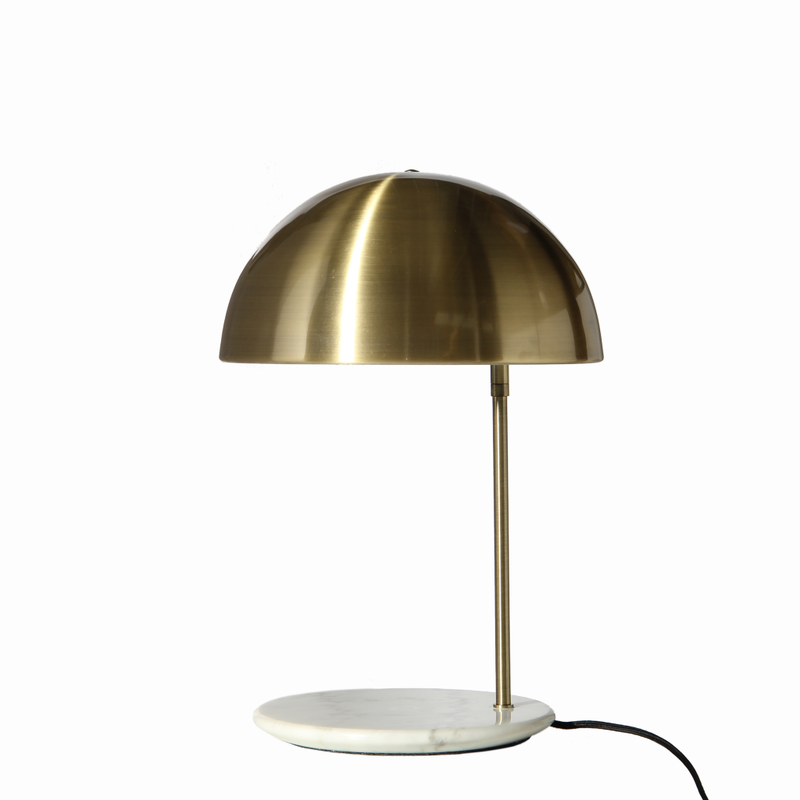 Table lamp with base in white marble and shade in brushed brass. 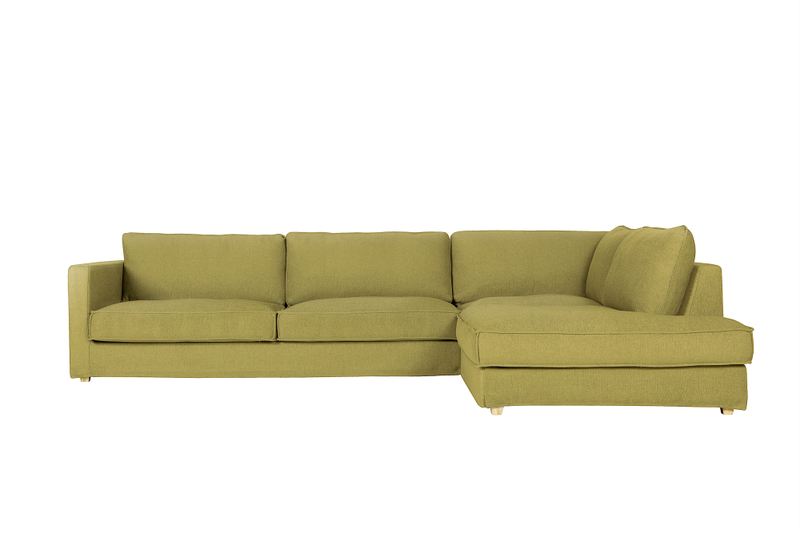 BIG sofa in Delight fabric in color Olive 2414, L340 x W340 x H75 cm. SQUARE coffee table with brass or green marble top and black metal legs, L50 x W50 x H52 cm, available in other colors and sizes. 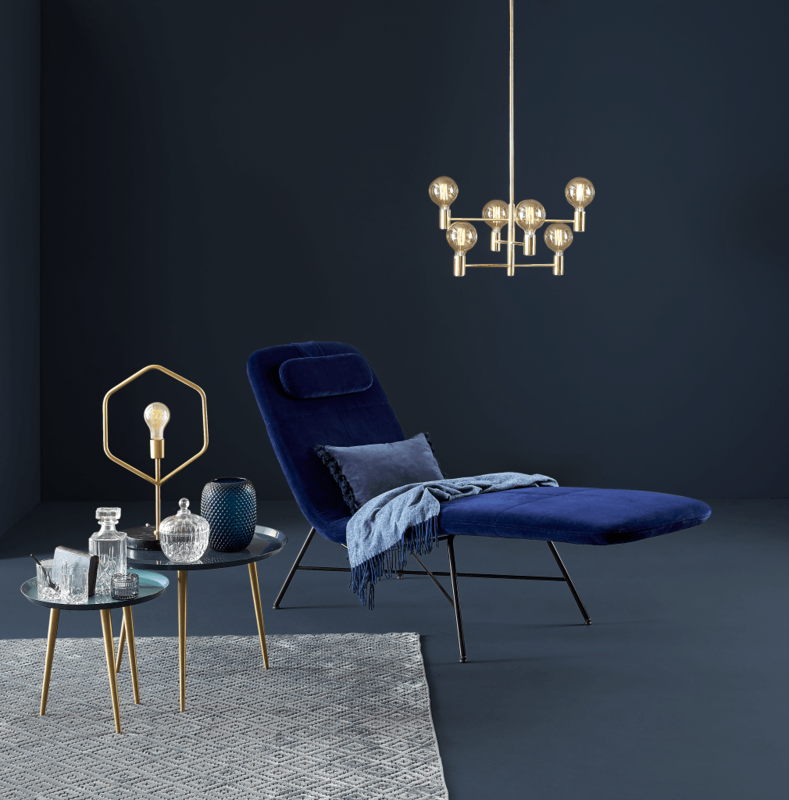 NAPPER daybed with pocket springs, in blue velvet and Baton legs in brass, L200 x W80 cm. SQUARE coffee table in green marble and black legs, L60 x W60 cm. GEOMETRIC table lamp in brass and whit marble base. FREJA-NEW WAVE 2 , original painting H120 x W90 cm. BUTTERFLY chair in green artificial leather with brass legs, designed by Marianne Bjarløv, L54 x W52 x H87 cm. 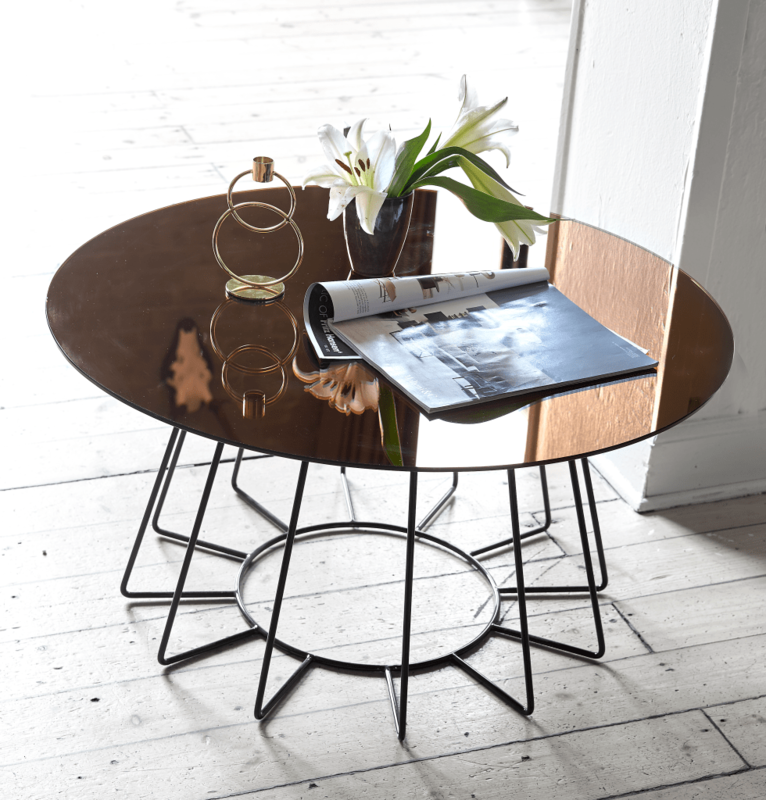 HELIX lamp table in rusty look melamine top and black legs, L75 x 75 x H40 cm. LANTERN in shiny brass, H36 and H46 cm. 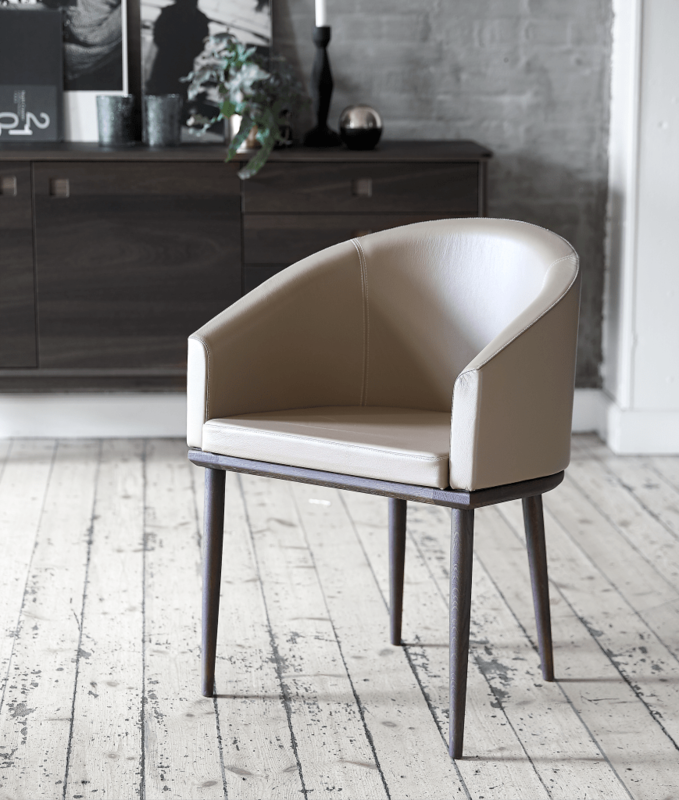 Swirvel chair in molded cold cure foam, designed by Says Who, in Balder leather color grey, L72 x W86 x H102 cm. Cushion, L50 x W50 cm. ANNA black leather cushion w/laser cuts, L45 x W45 cm. ANNA grey leather cushion w/laser cuts, L45 x W45 cm. 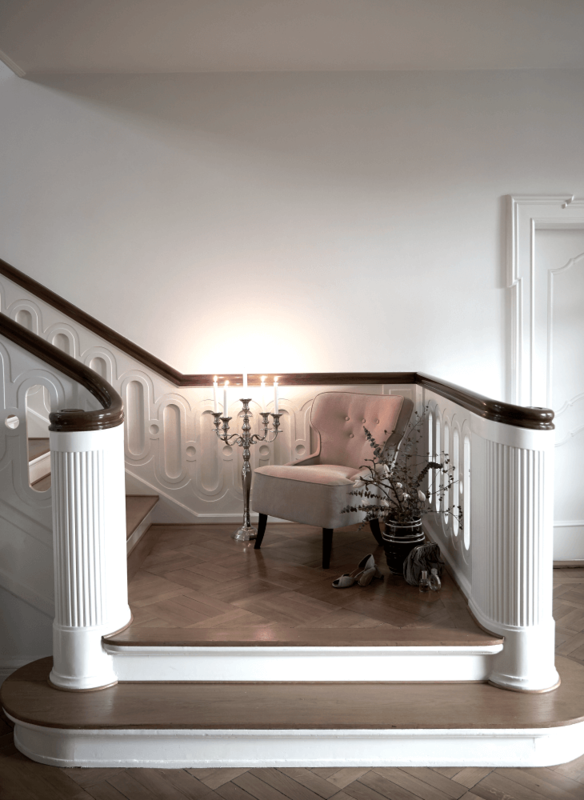 Combination in white / oak, L306 x W180 x H45 cm. 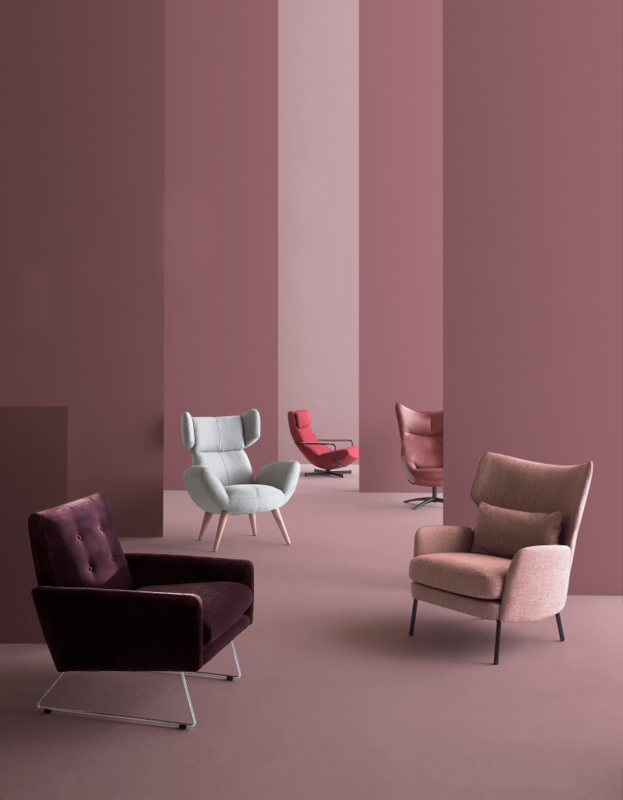 MAX recliner in Classic velvet, color 10 bordo, designed by Ian Archer, L68 x W80 xH83 cm. ALEX recliner in Flossy fabric, color 9 Aubergine, designed by Dan Ihreborn, L79 x W93 x H93 cm. 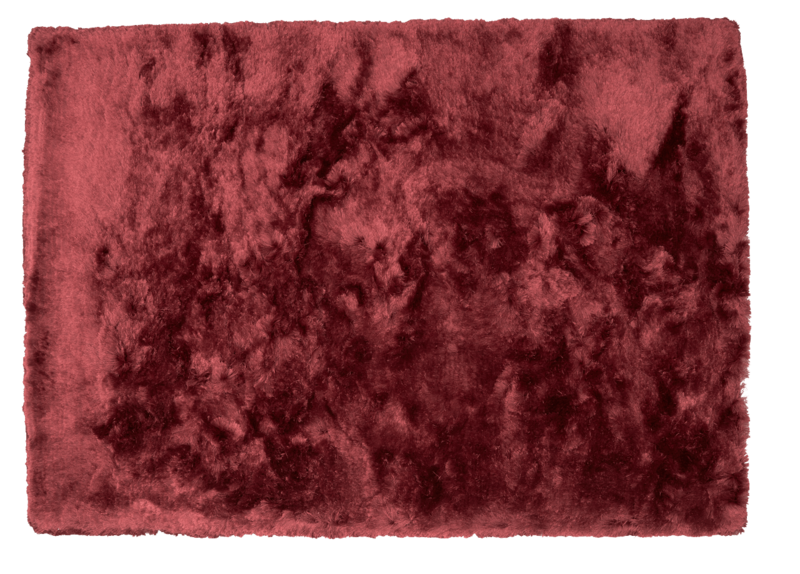 NUBIO in Nature fabric, color Wine red 4021, L74 x W98 x H90 cm. 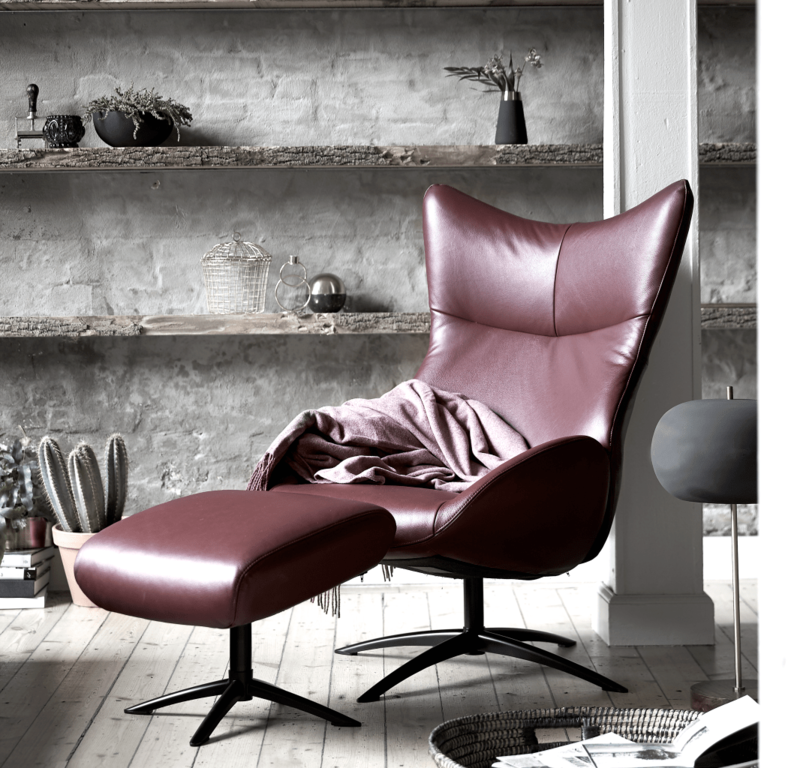 AMBIENCE swirvel recliner in moulded cold cure foam in Balder leather, color Wine red 6421, base in black, L80 x W96 x H112 cm. BALFOUR resting chair in Corsica fabric, color light grey 40, oil treated ash legs, L90 x W88 x H109 cm. 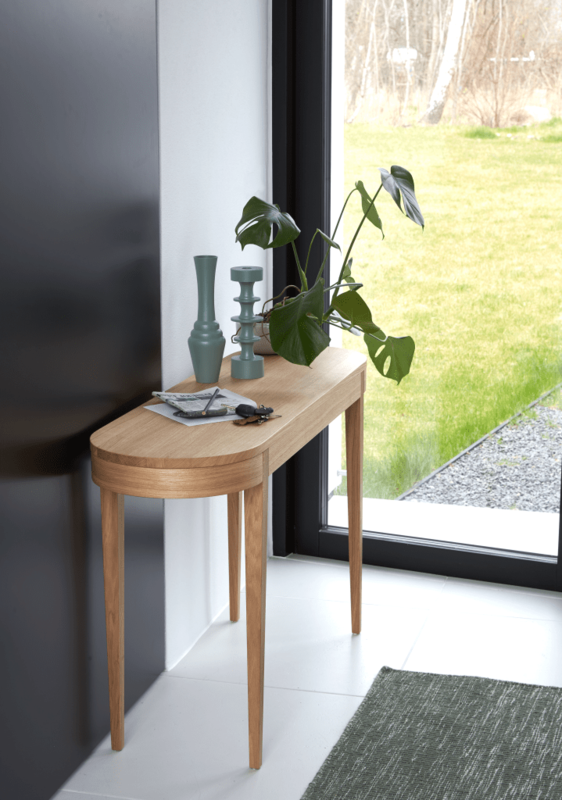 Console in oak, designed by Niels Gammelgaard, L120 x W35 x H70 cm. GREEN flat weave wool rug with fade-out tones, L240 x W170 cm. 3 seater sofa with open end, loose cover, in Cedros fabric, color mustard, L346 x W235 x H85 cm. Side table in aluminium with decoration, H53 or H 66 cm. 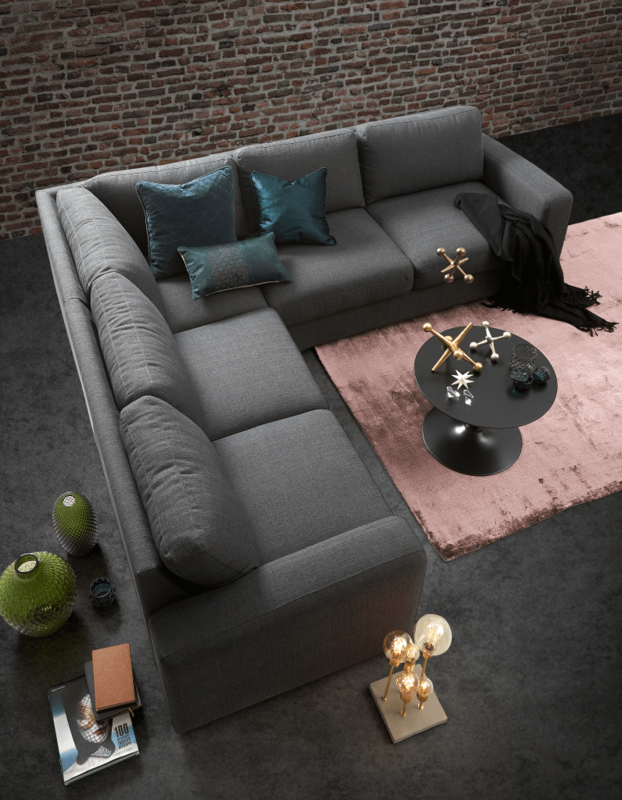 Sofa in rosa velvet, black legs,L160 x W77 x H87 cm. 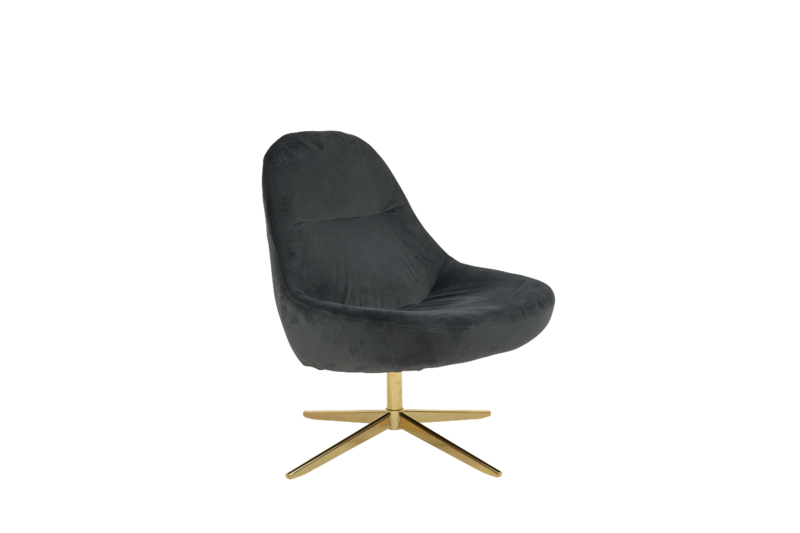 SOFICE recliner in rosa velvet, black legs,L74 x W77 x H89 cm. ALISMA coffee table top with marble look and gold colored base, D80 x H45 cm. CARIKKO console, wood lacquered white antique look, with 2 drawers,L92 x W39 x H75 cm. SPHERE table lamp in black metal w/oak wood handle, H32,5 cm. CANDLE holder in black powderbrushed metal, H29 cm. ONA black decoration hand, H35 cm. AMBIENCE swirvel recliner, moulded cold cure foam, Balder leather color wine red 6421, base SUB black, W80 x D96 x H112 cm, footstool W56 x D50 x H44 cm. 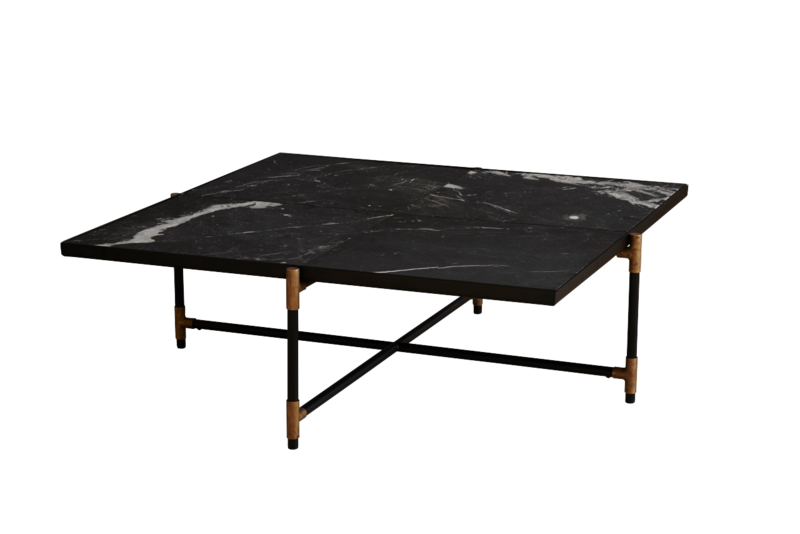 Coffee table, black marble and black lacquered base, D45 x H57 cm. 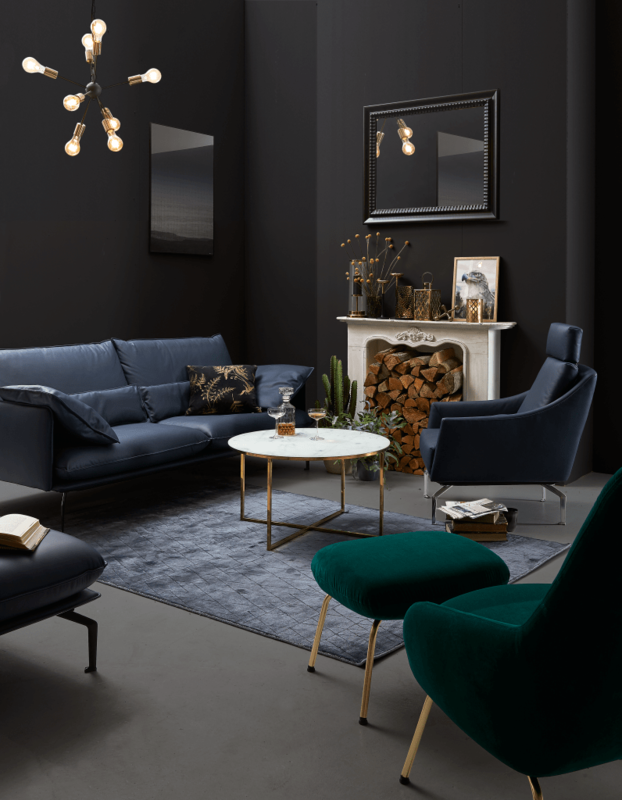 TRACE chair and pouf in green velvet, brass legs, designed by Says Who, L70 x W78 x H100 cm, footstool L54x W45 x H40 cm. 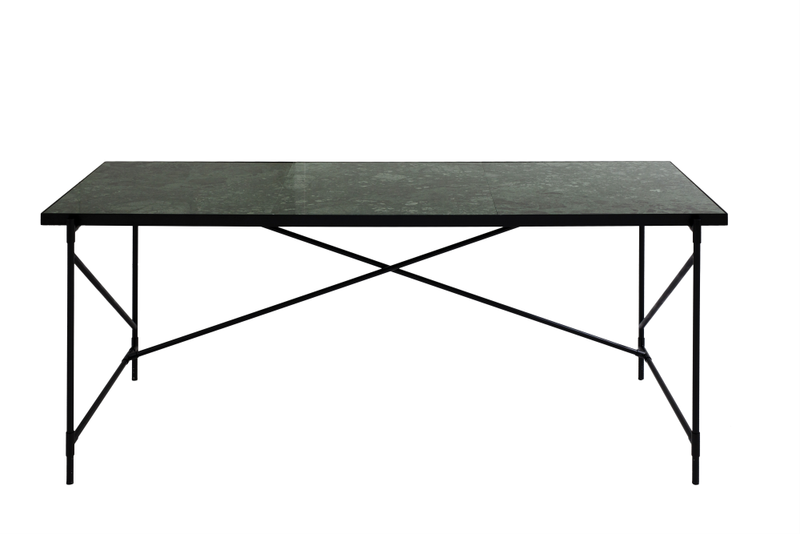 SQUARE coffee table in green marble black steel legs, L40 x W40 x H41 cm. CANISTER in metal and brass, black marble look, D16 cm. GEOMETRIC table lamp in brass and white marble base. 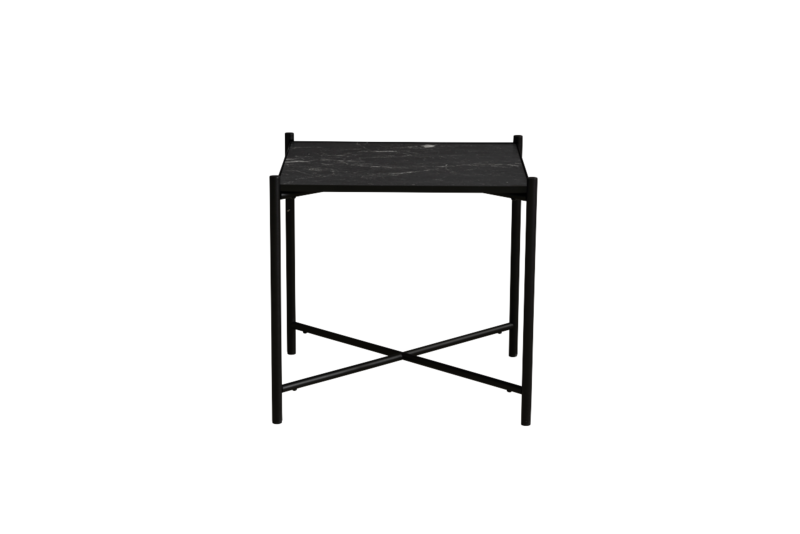 Side table in black metal with black mirror top, D43 x H 45 cm. 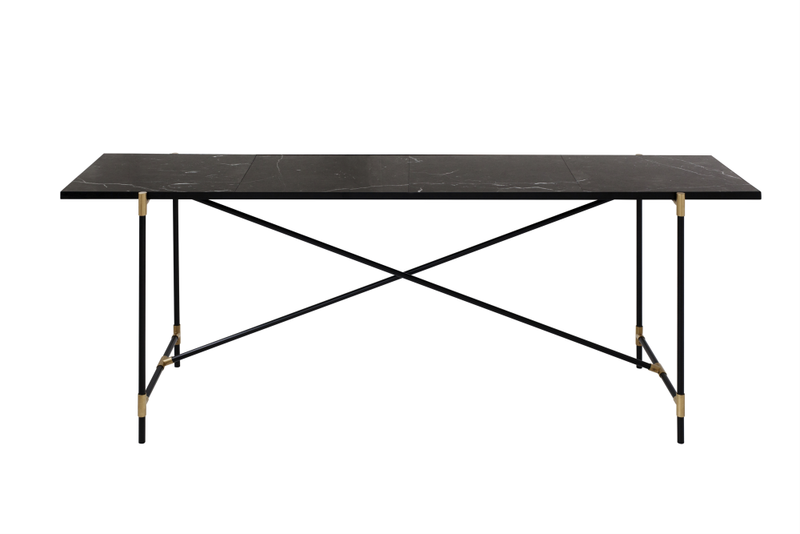 COFFEE table 90 in black marble, black metal legs with brass, L92 x W92 x H32 cm. 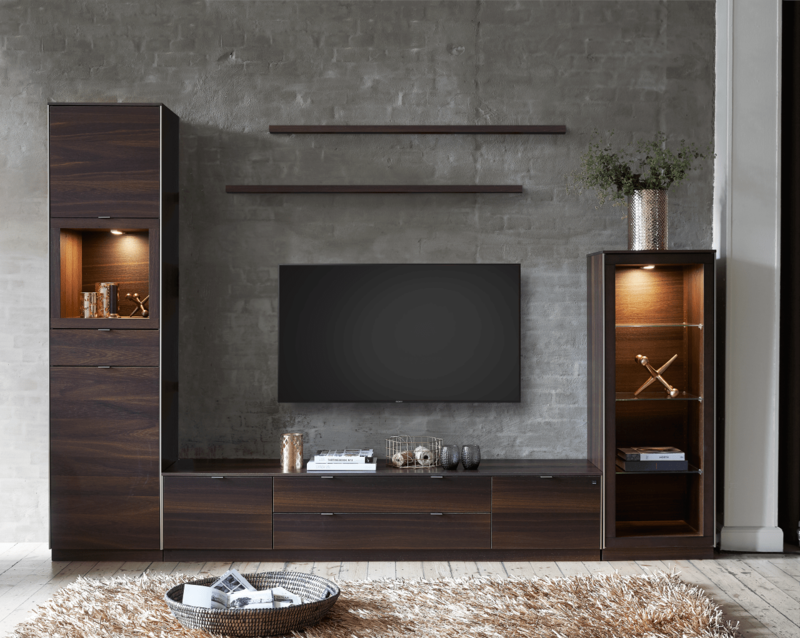 In lacquered smoked oak, SM913ED Display cabinet, L50 x W44 x H136 cm. SM941ED TV/Hi-Fi Flowboard. Includes a receiver that catches signals from a remote control, L194 x W44 x H40 cm. SM914ED Display cabinet, L50 x W44 x H200 cm. In 1493 Cevio Mocca Brown L241 x W97 cm. SQUARE coffee table in black marble and black frame, L40 x W40 x H41 cm. 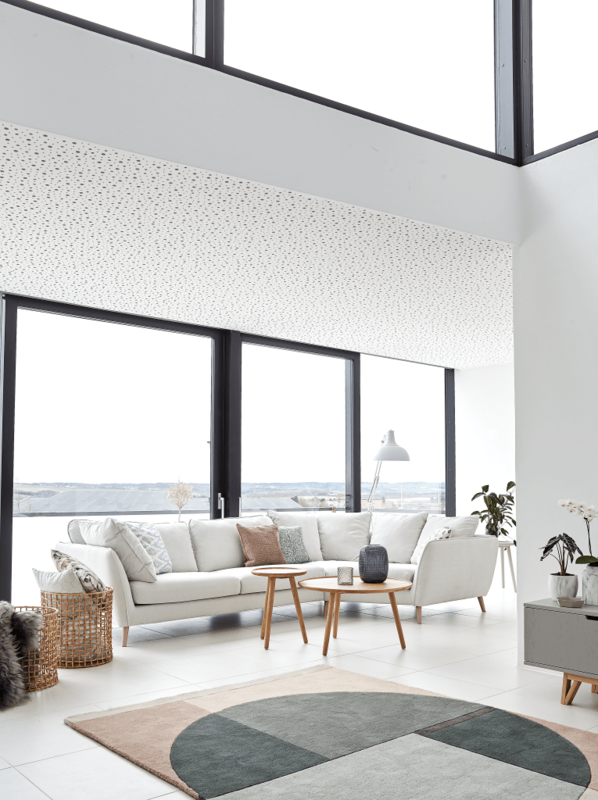 CUBE storage in white high gloss L57 x W51 x H31 cm. DUPION cushion in green silk, L50 x W50cm. ELLINOR cushion with decoration, L45 x W45 cm. 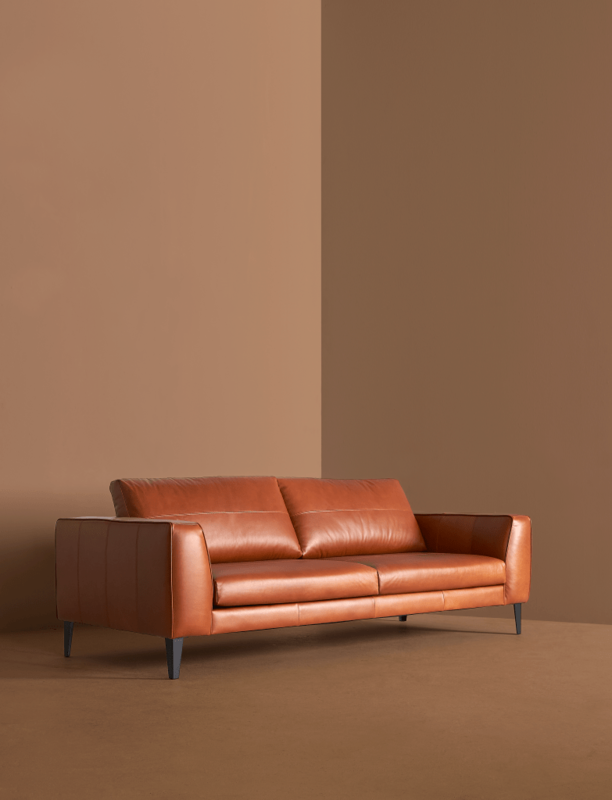 3 Seater sofa in Vintage leather color Chestnut brown, designed by Askhan Heydari, L230 x W97 cm. 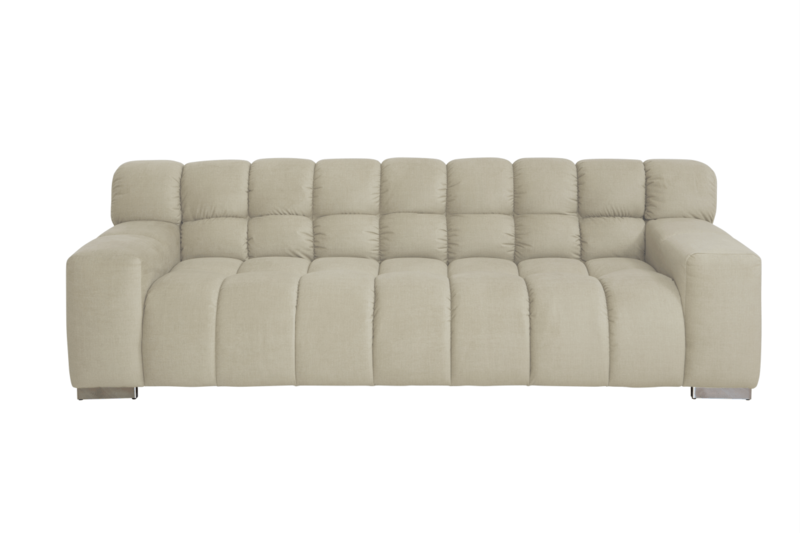 2427 Corner sofa with open end, in cat 4 leather color Light Grey 4056 with stitchings, L335 x W299 x H104 cm. GLEAM coffee table in green marble with black lacquered metal legs, L120 x W75 x H40 cm. CUBE storage, wengé, L139 x W29 x H31 cm and L57 x W51 x H31 cm. MALTINO shaggy rug in 100% polyester, olive green, L240 x W170 cm. STOCKHOLM Coffee table L117 x W58 x H46 cm. In green marble, black metal legs, L181 x W65 x H74 cm. 3 Seater modular sofa with open back and chaiselong, adjustable neck, in Taft fabric in mixed colors, L287 x W232 x H75 cm. BALFOUR resting chair in Corsica fabric in color light grey 40, legs in oiled oak, L90 x W88 x H109 cm. SECRET coffee table in oak, D40 x H55. 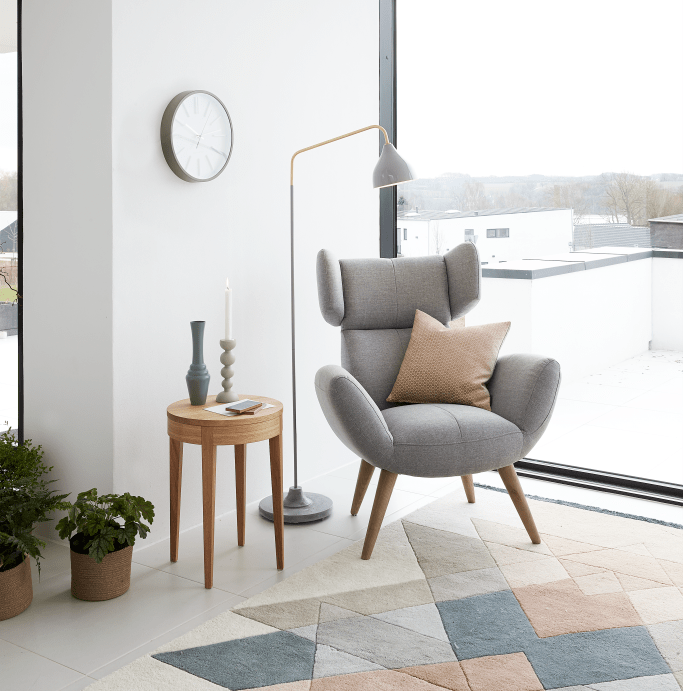 BALLINA hand tufted rug in 100 % wool pastel color mix, L240 x W170 cm. FIXED floor lamp in grey metal and mat brass. TIME wall clock in white face and wood frame, D35 cm. 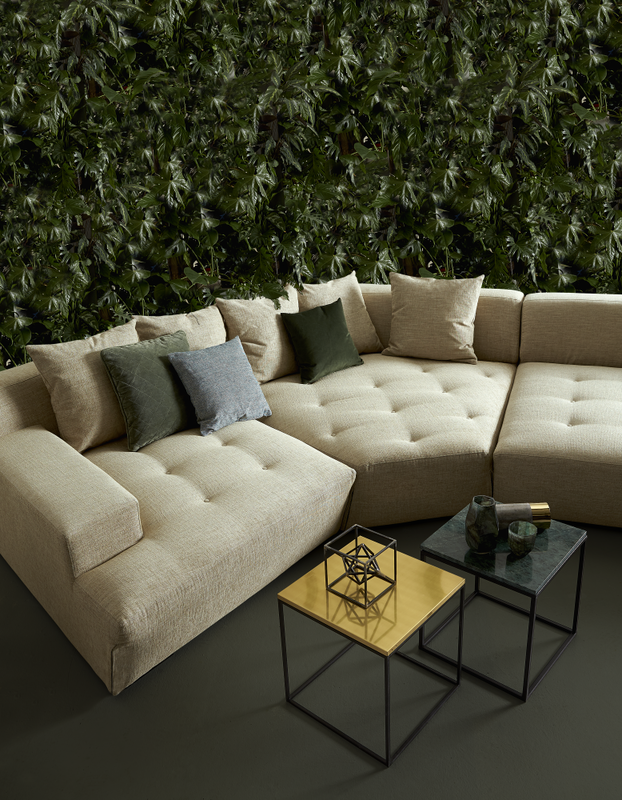 3 seater sofa in Riccia 1575 Grey, designed by Ashkan Heydari, L243 x W92 cm. PATRICE 3 seater with corner in Baletti fabric in color Platinum grey 2436, L319 x W247 cm. DUSK coffee table in eucalyptus, matt, L130 x W130 x H40 cm. TOKYO lamp table in eucalyptus, matt L62 x W62 x H47 cm. MALTINO shaggy rug in 100 % polyester, anthracite grey, W170 x L240 cm. COSSANO pendant in dark brown wood, D70 cm. CACTUS handmade blue ceramic vase, H15/30/45 and 60 cm. BONNA lantern in antique metal, H58 or H80 cm. 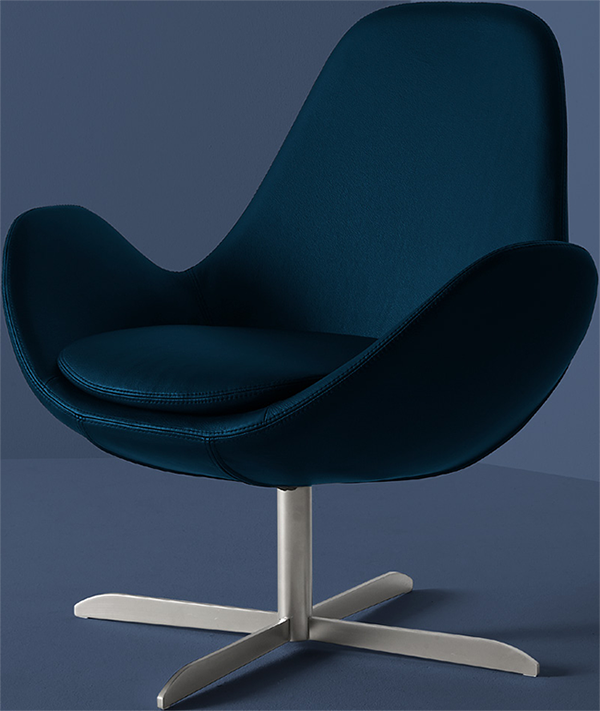 GHOST Chair in Vintage leather, color 0882 denim blue, foot 40 in stainless steel, L87 x W82 x H90-cm. 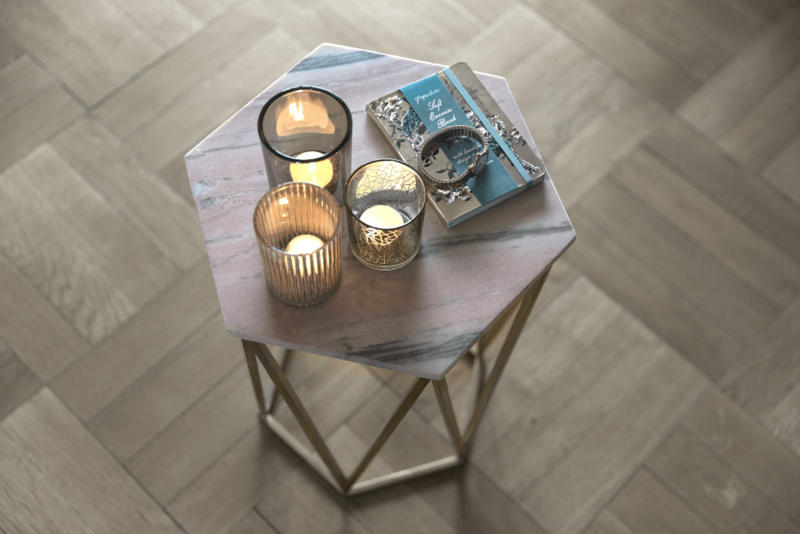 Side table in light rose marble and mat brass base, H 47 cm. 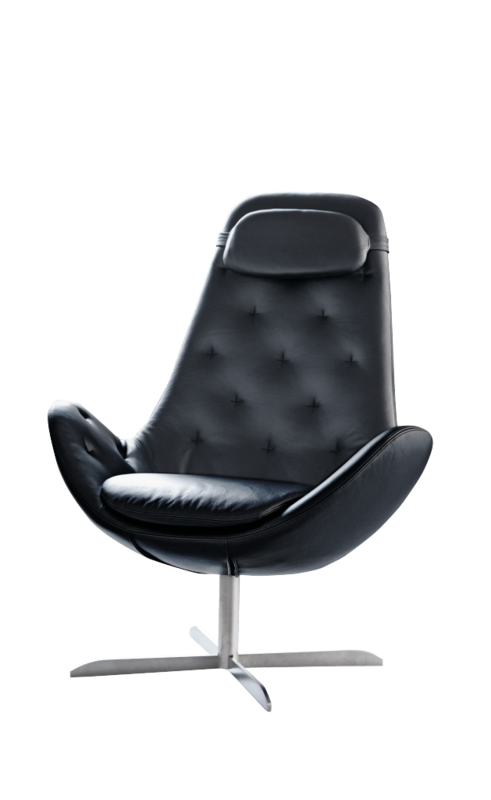 Recliner in black leather W90 x D87 x H109 cm. 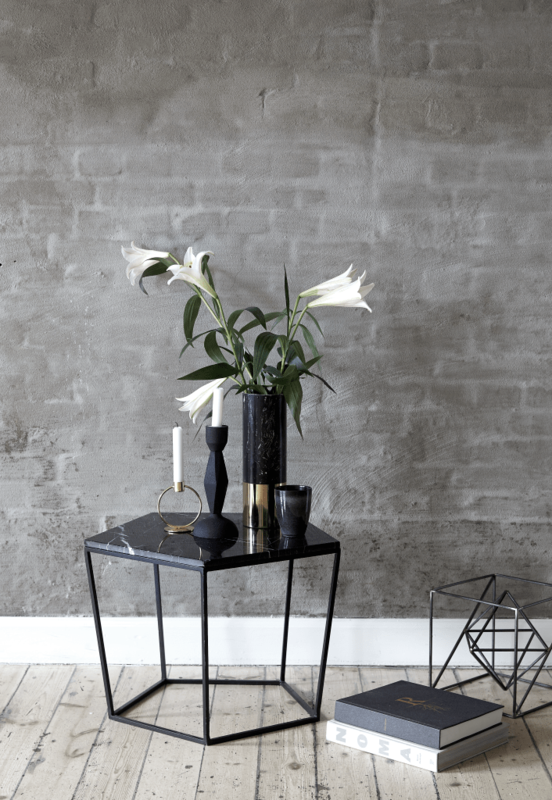 SIDE table in black marble, black metal legs, L48 x W48 x H43 cm. 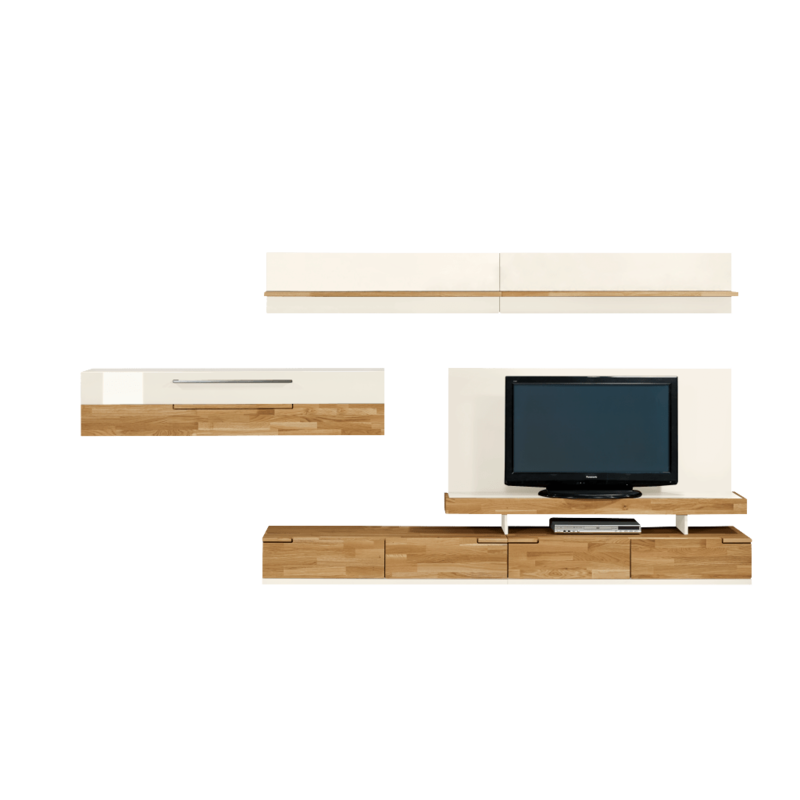 Combination in Bianco white highgloss lacquer and solid oak, L315 x W165 x 45 cm. 1844 2 Seater sofa + pouf, in Madras leather color blue 272, L211 x W100 x H90 cm. 1426 chair in Madras leather color blue 272, L89 x W74 x H90 cm. 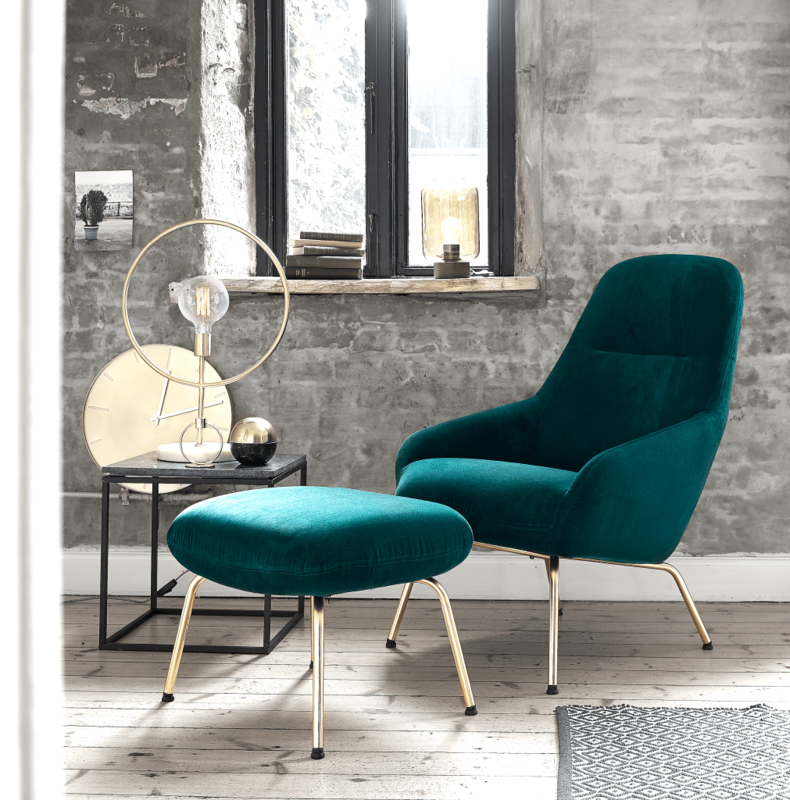 TRACE chair and footstool in Velvet, color Green 123-271 with legs in brass, chair: L70 x W78 x H100 cm, footstool L54 x W45 x H40 cm. ALISMA coffee table with marble look and brass, D80 x H45 cm. 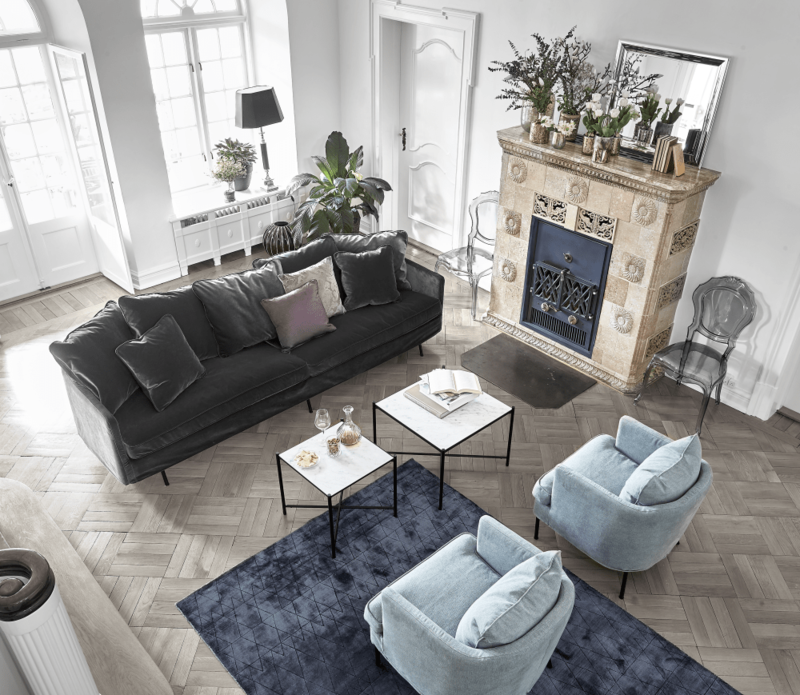 ALTENAV tufted rug in 100 % viscose, midnight blue with decoration, L240 x W170 cm. 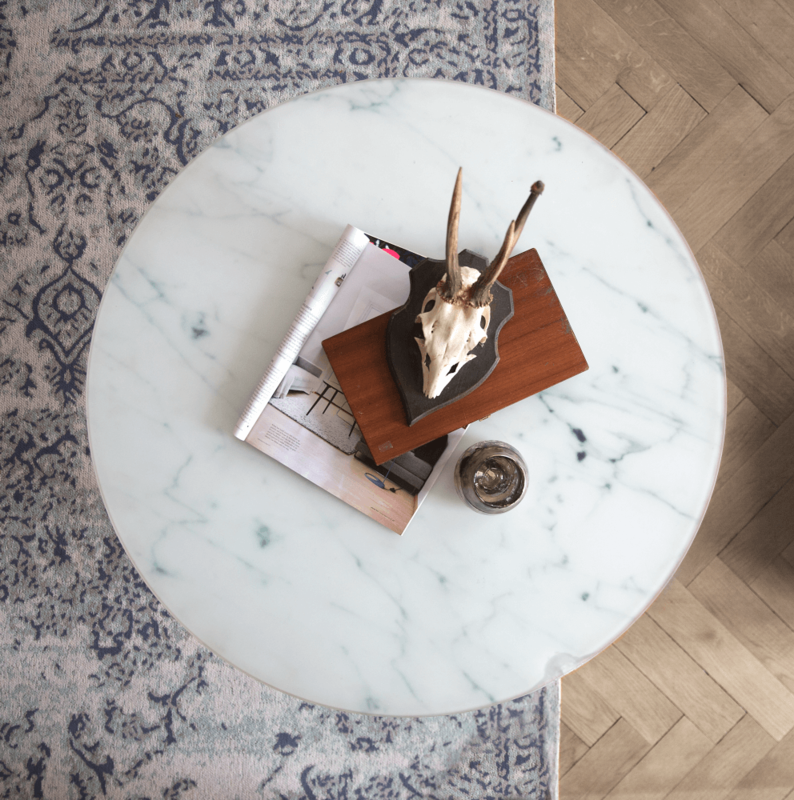 SQUARE coffee table in brass or green marble with black legs, available in different sizes and colors. Armchair in light grey velvet, designed by Niels Gammelbaard, L77 x W78 x H77 cm. 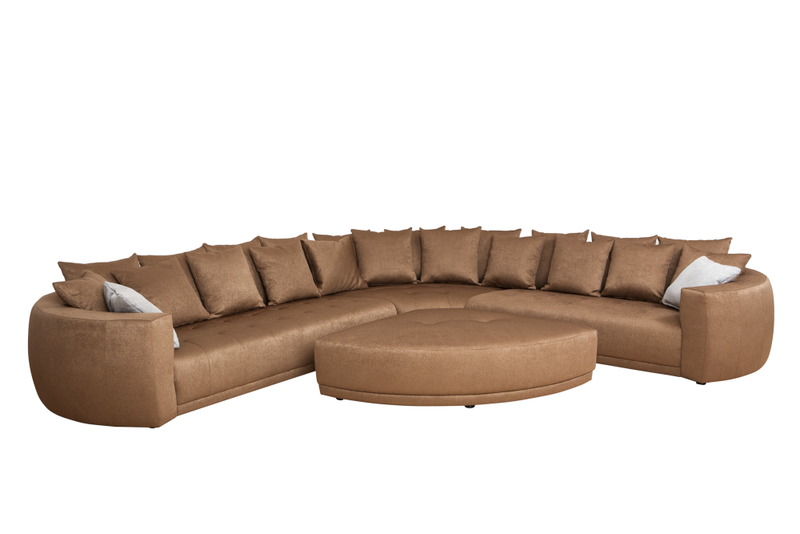 Corner sofa with open end and chaiselong in Lecce 1592, designed by Ashkan Heydari, L309 x W290 cm. 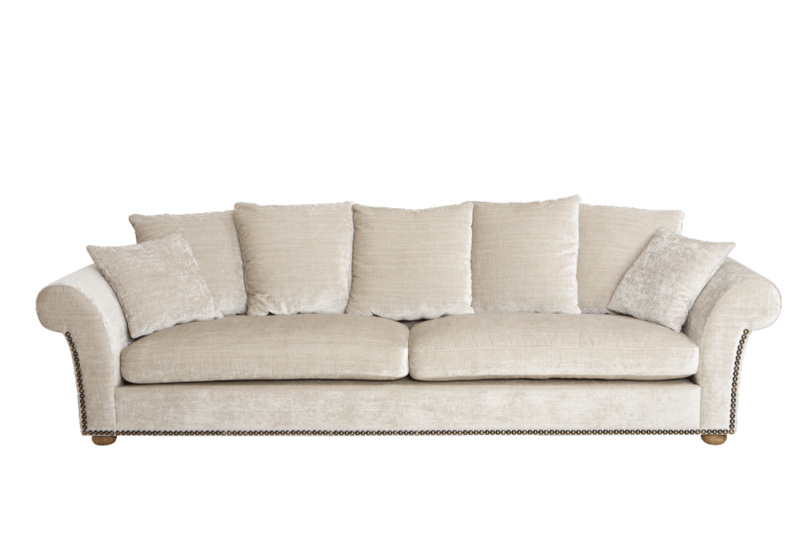 Sofa with chaiselong and armrest version 4, in Lesina 1561 fabric, L251 x W161 x H66 cm. 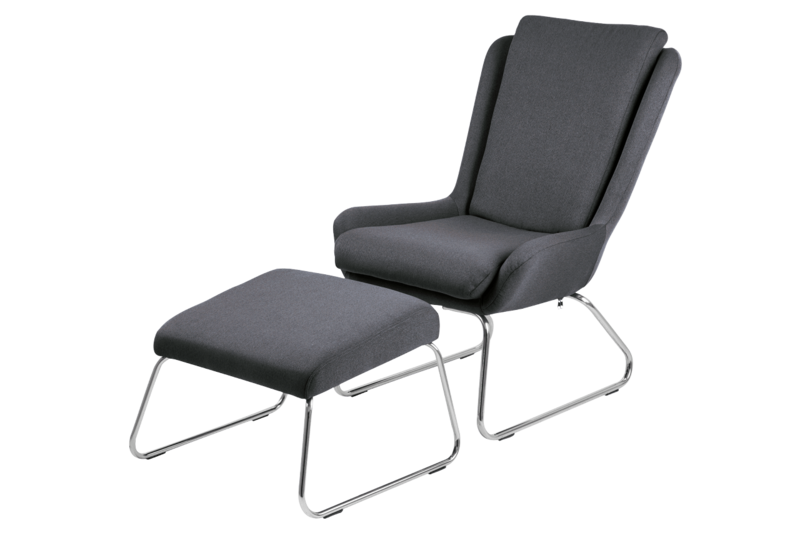 Resting chair and footstool in Town fabric color dark grey 33, base in chrome, L94 x W66 x H132 cm. 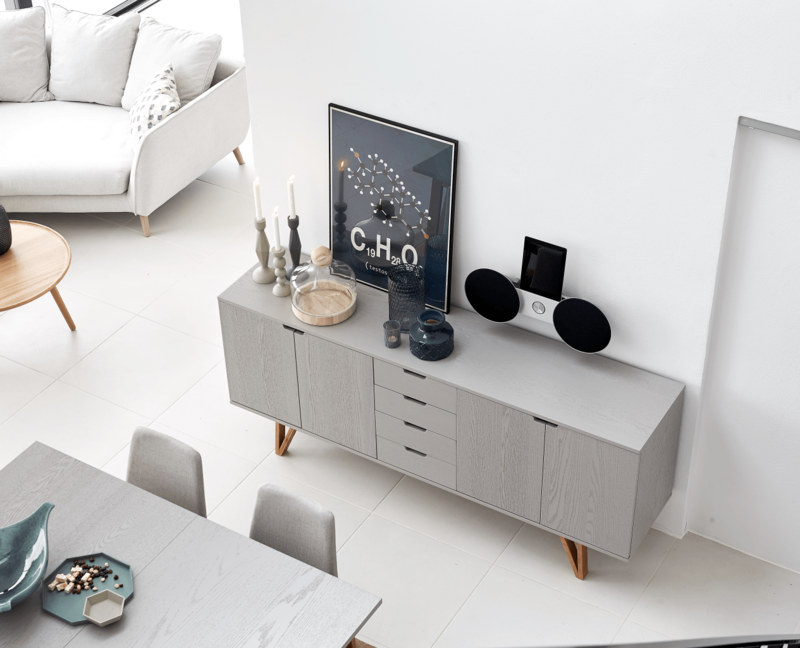 Sideboard, designed by Says Who, in grey stained / oak L198 x W45 x H85 cm. 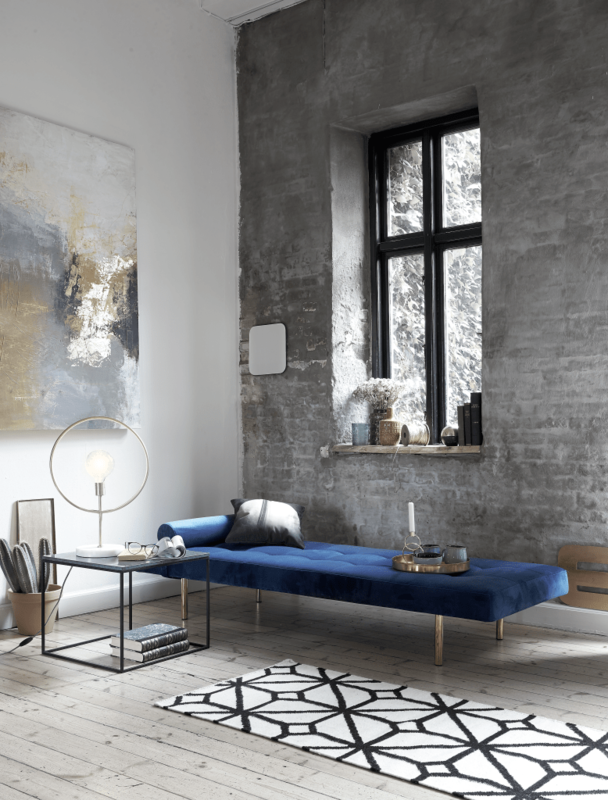 WAVE daybed, designed by Says Who, in moulded cold foam, in fabric Velvet color Navy blue 123-161, black frame, L176 x W66 x H93 cm. CAPITAL pendant in brass with 6 bulbs, D66 cm. 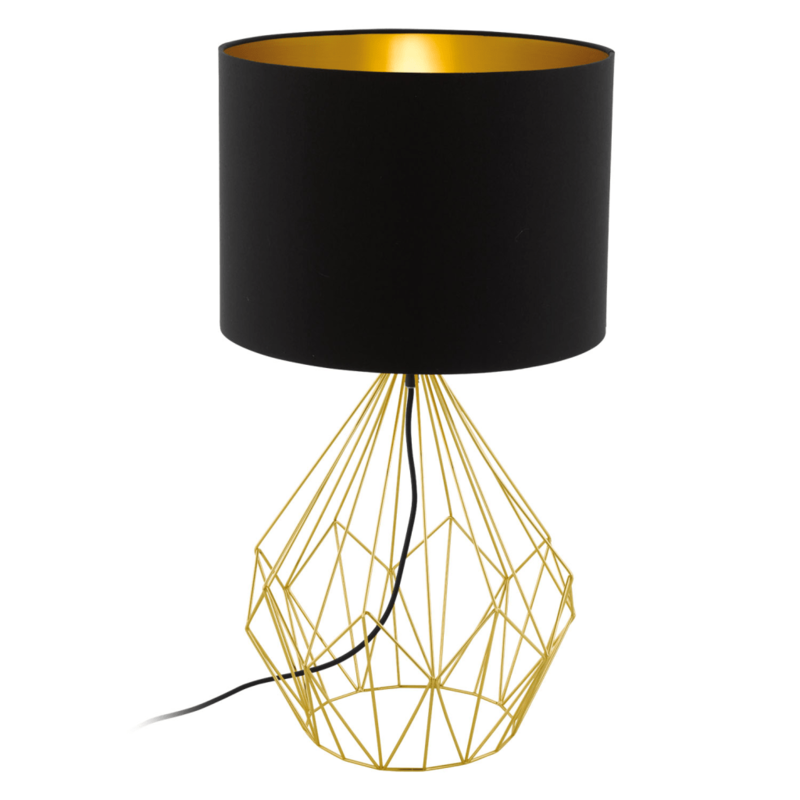 GEOMETRIC table lamp in brass and base in black marble. BOB nesting tables with base in brass, top in midnight blue metal, D57 x H42 cm and top in dusty blue metal, D40 x H 37 cm. 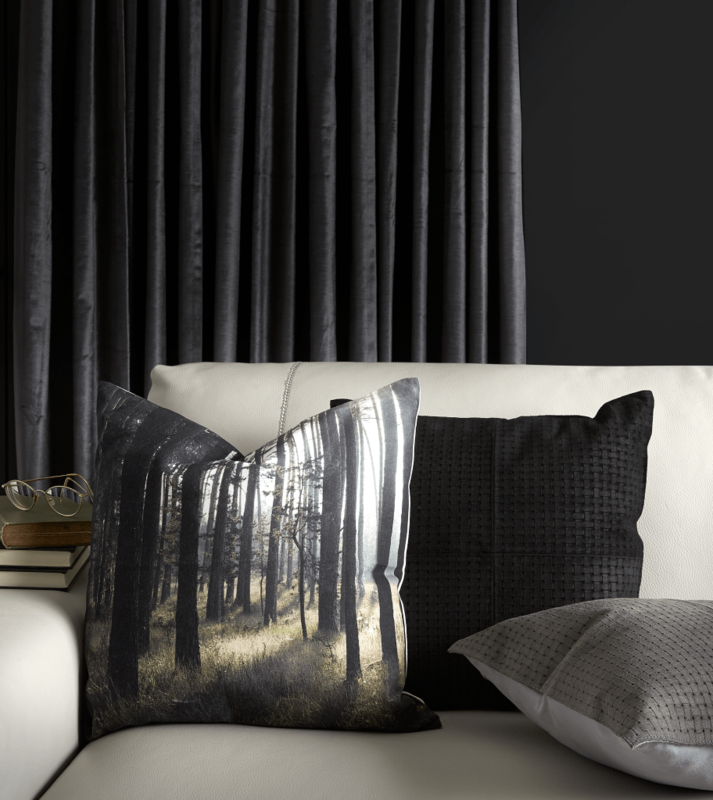 FRINGES velvet cushion in midnight blue with fringes, H35 x W45 cm. 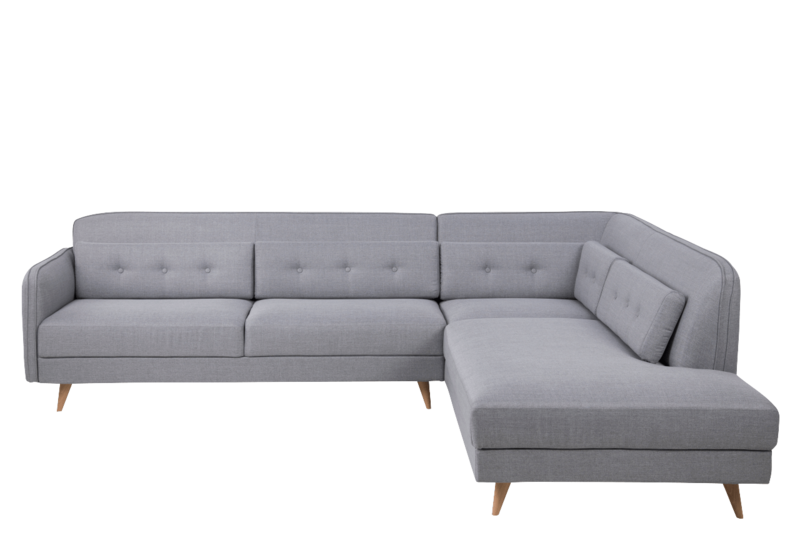 Corner sofa with rest module right, in Portland light grey 91, legs in beech, Lumbar cushios with buttons, L289 x W244 x H83 cm. With gold colored top and black painted frame, D40 x H50 cm. TRACE HIGH recliner in leather. 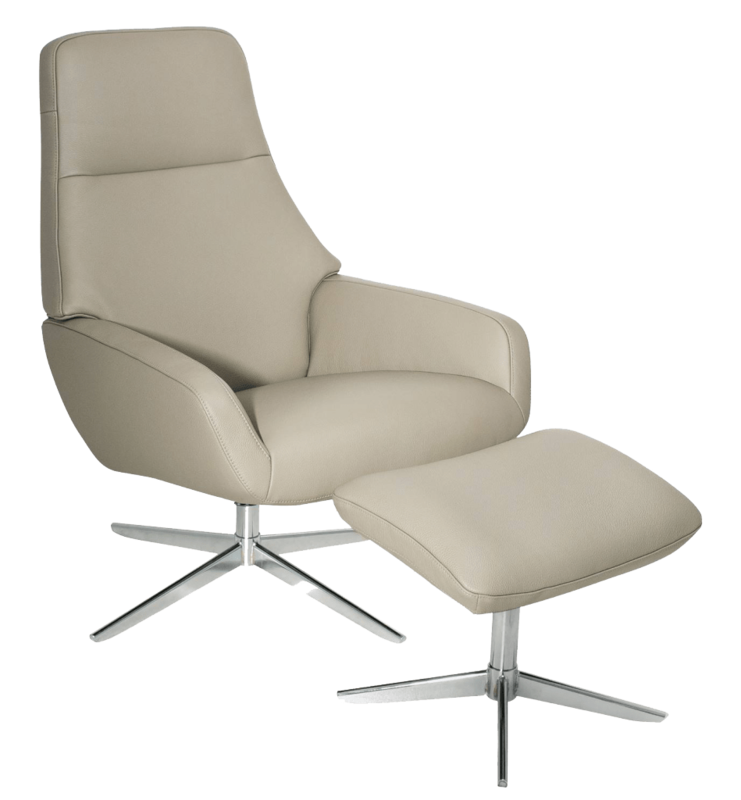 Swirvel recliner in moulded cold cure foam, Club royal leather in color taupe, L68 x W89 x H97 cm, footstool L55 x W37 x H43 cm. 3 Seater sofa in white PU, L242 x W107 x H70 cm. CARIKKO console in lacquered wood, white antique look, 2 drawers, L92 x W39 x H75 cm. BASILANO chandelier in clear glass with 18 light bulbs, D100 cm. Rug in cotton and polyester, L240 x W170 cm. 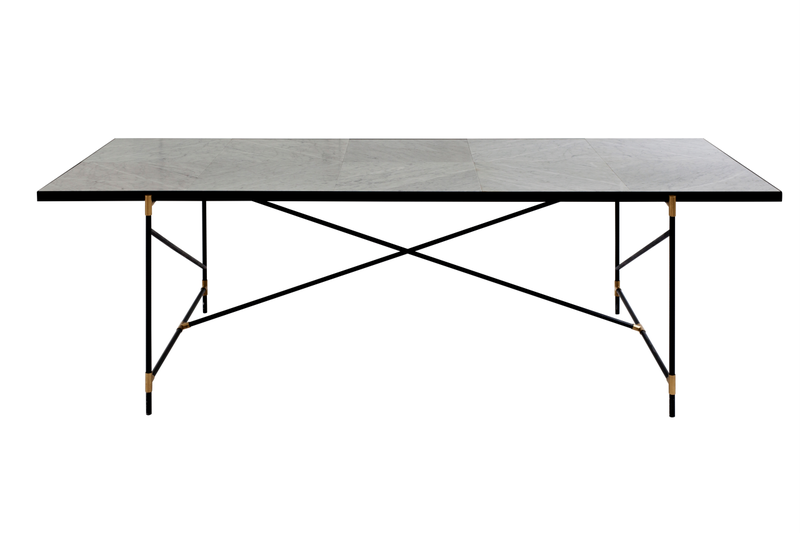 Dining table 230 with white marble top and black metal legs with brass L230 x W92 x H74 cm. Console with 1 drawer, wall mounted, L66 x W31 x H70 cm. 2 Seater sofa with open end and chais in Dawn fabric, L347 x W219 x H84 cm. 2 seater sofa in Touch fabric, color olive, with chrome legs, L209 x W98 x H77 cm. 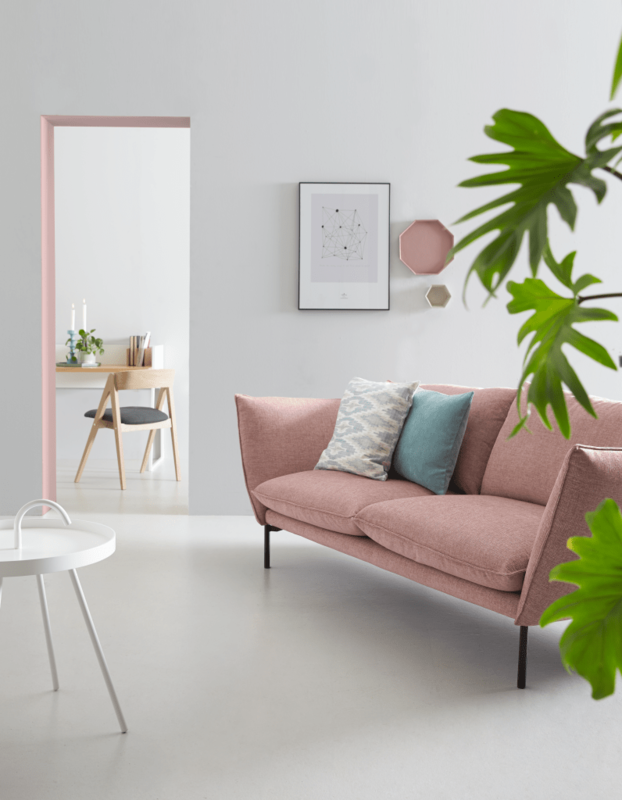 Sofa designed by Niels Gammelgaard in Step pink, with decoration cushions, legs in oak, L238 x W88 x H77 cm. HIGHLAND range with rivets in Homcho fabric in 478/04 dark grey. HIGHLAND sofa 3 seater L204 x W91 x H104 cm. HIGHLAND Recliner with pouf L74 x W91 x H104 cm. LARGE POUF L56 x W44 x H44 cm. 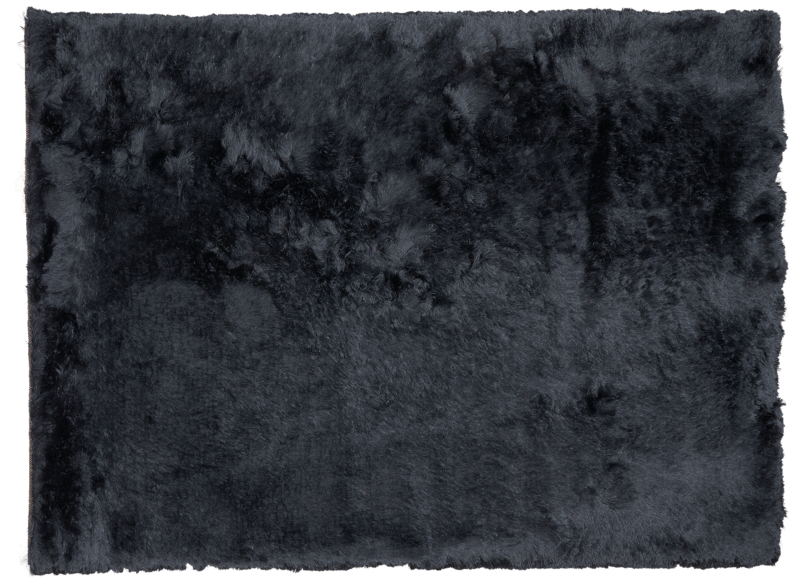 MALTINO shaggy rug in 100 % polyester, anthracite grey, W170 x L240 cm. 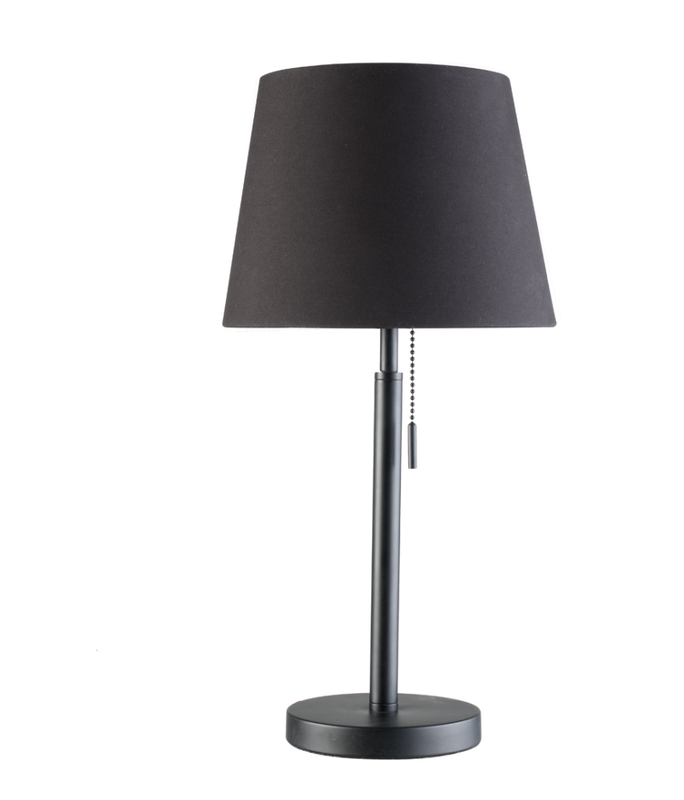 MARALA large table lamp, silver aluminium and black, H 71 cm. 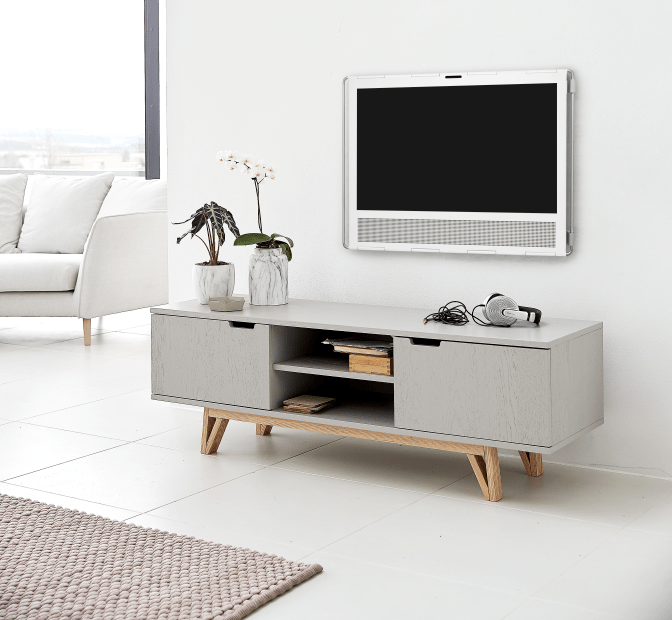 TV bench, designed by Says Who, in light grey with oak legs, L150 x W45 x H50 cm. SMOCK cushion in light green velvet w/smocking, L40 x W40 cm. JUNE cushion black/natural w/fringes, L46 x W 58 cm. CIRCLES cushion in Moss color, L40 x W60 cm. 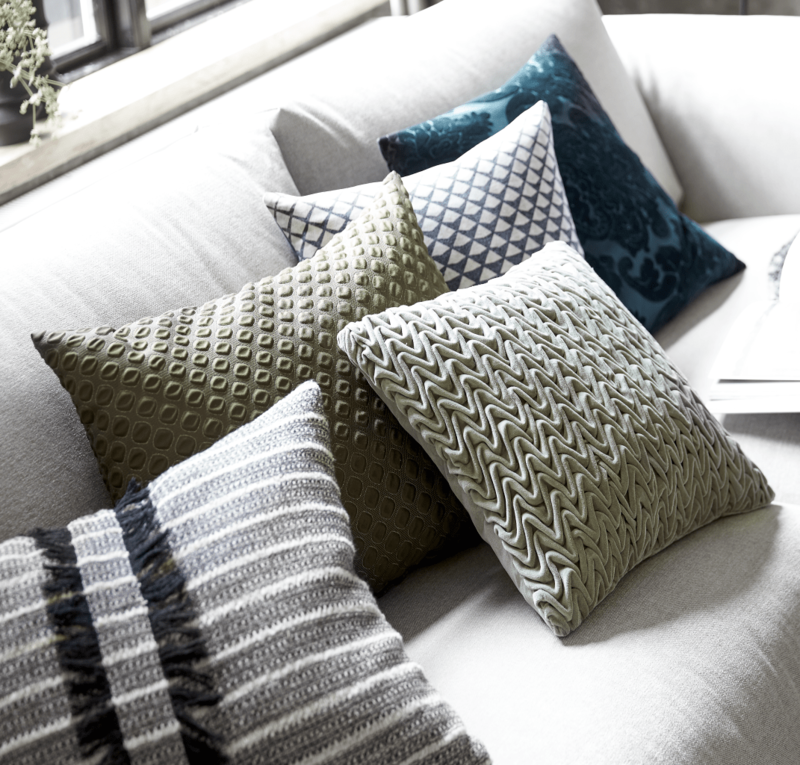 GRAPHIC FADE cushion in b/w pattern, L45 x W45 cm. CHATEAU cushion in dark green velvet w/print, L 50 x W50 cm. Table lamp with silver and black base and black shade. 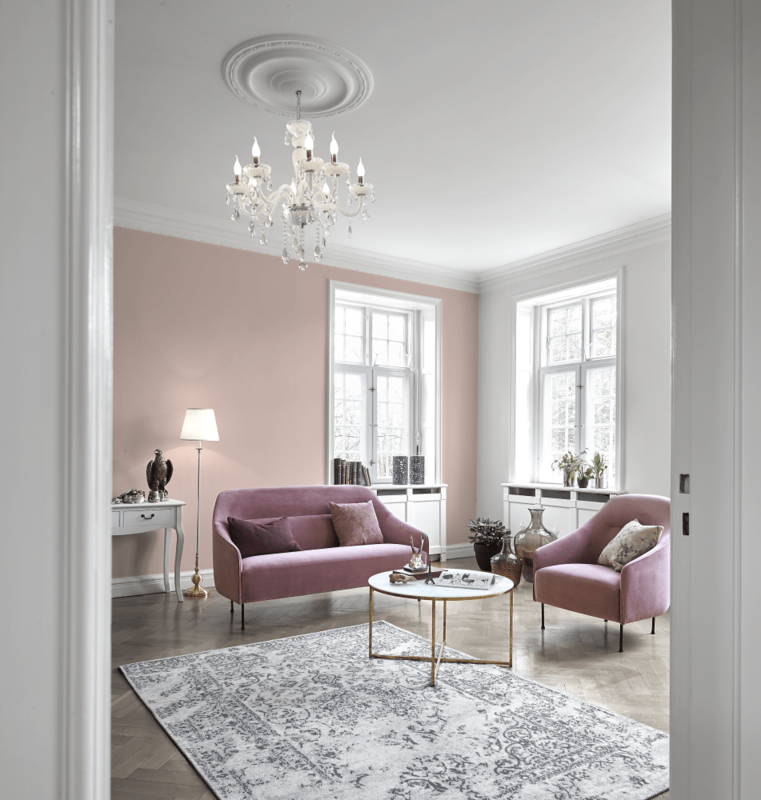 Recliner in Caleido fabric in color 2990 powder pink, with black legs, L79 x W71 x H80 cm. VICTORIA candelabra in shiny aluminium, H 80 cm. 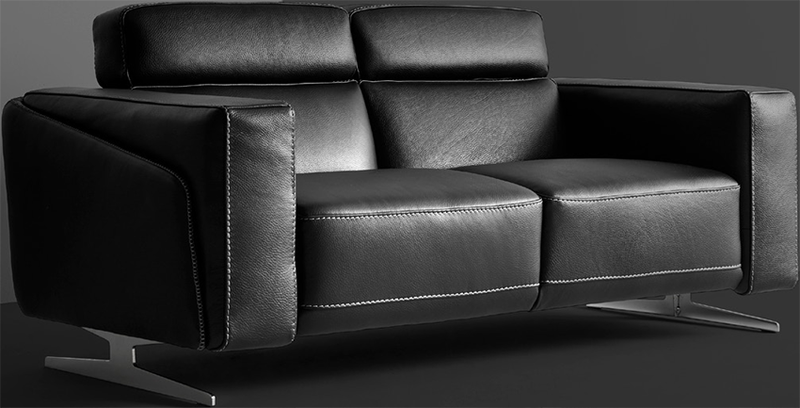 2 seater sofa in leather black, L191 x W96 cm. 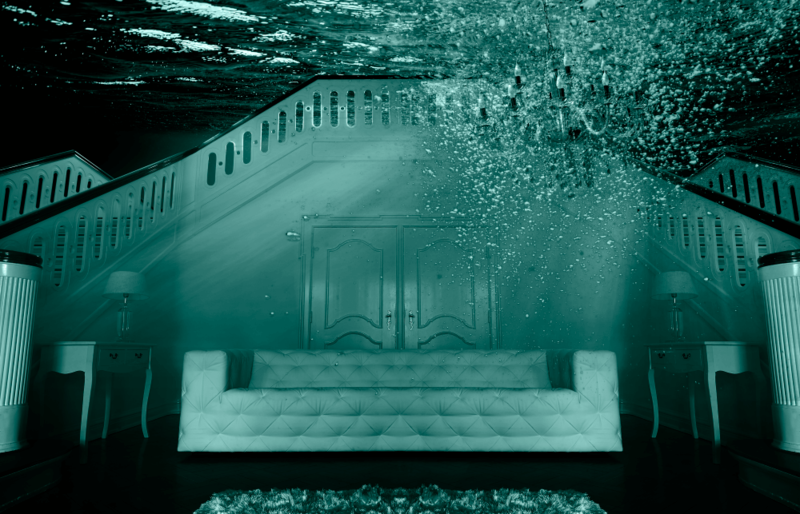 The perfect sofa, suitable for every environment! Especially envisioned to stand in the middle of your room. 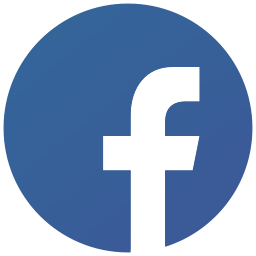 This design gives you high value from simplicity. 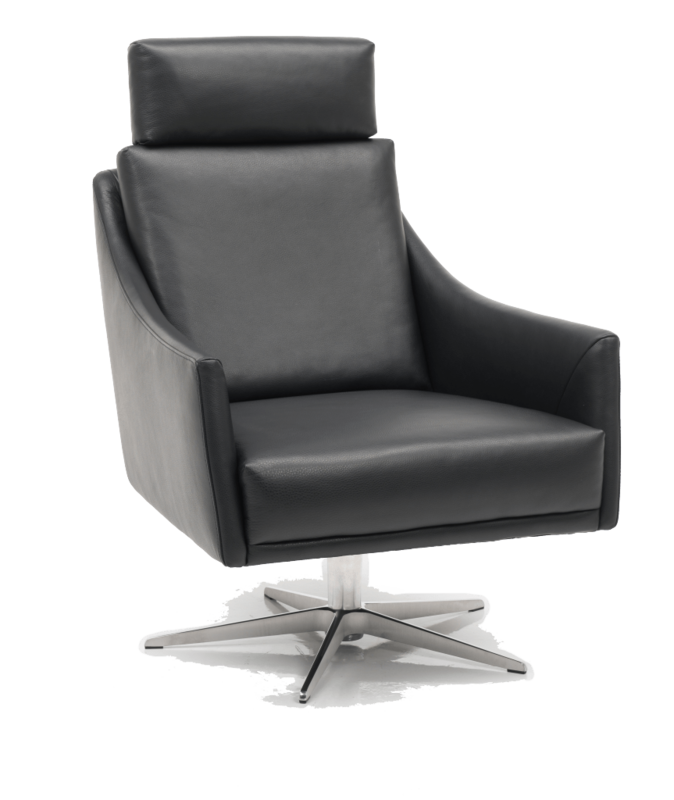 Swirvel and adjustable recliner in moulded cold cure foam, in Balder leather color black, L62 x W81 x H102 cm. With open end small, in Nova fabric color antrazit, L236 x W200 x H78 cm. Sofa, designed by Ashkan Heydari, in fabric Lesina 1561, L240 x W93 cm. MALTINO shaggy rug in 100 % polyester, L240 x W170 cm. 2 Seater lounge cahise, left, in Holly fabric color grey 7, chrome legs, L302 x W162 x H84 cm. Corner sofa, in Disco Queen fabric, color 704/30, L390 x W359 x D123 cm. In black marble top, black metal legs with brass, L184 x W50 x H74 cm. 2 seater sofa in Kiss fabric color Wine red, L236 x W103 x H87 cm. 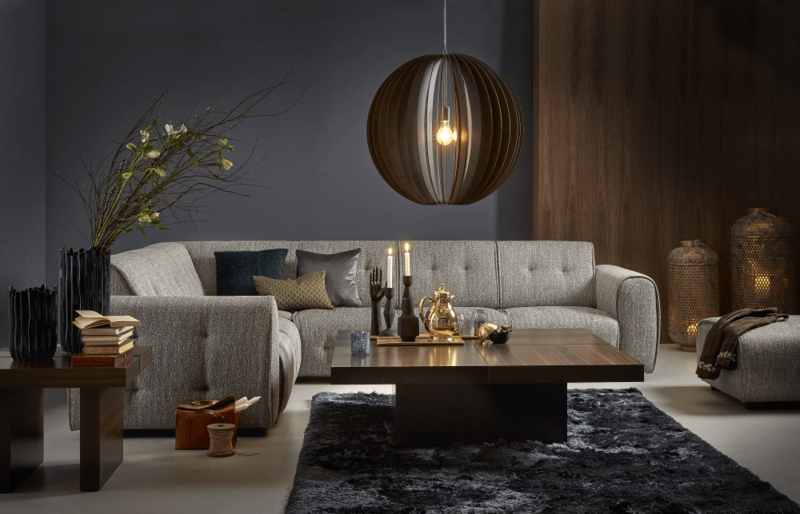 2817 3 seater sofa with chaiselong in leather Aniline cat 6 color 4451 and GIN21 fabric color T Moro, L332 x W105/173 cm. 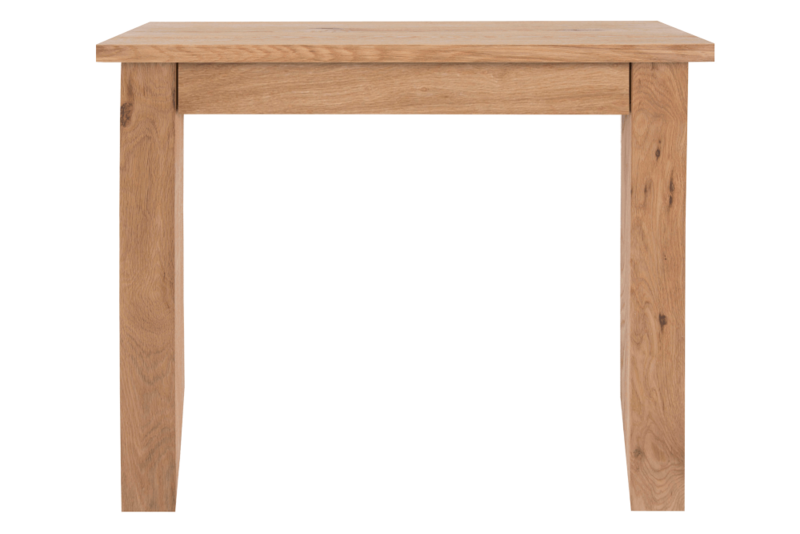 SM205ED coffee table in lacquered smoked oak, L135 x W77 x H47 cm. EASTWAY Recliner in leather Aniline cat 6 color 4451 brown, L68 x W84 x H79 cm. 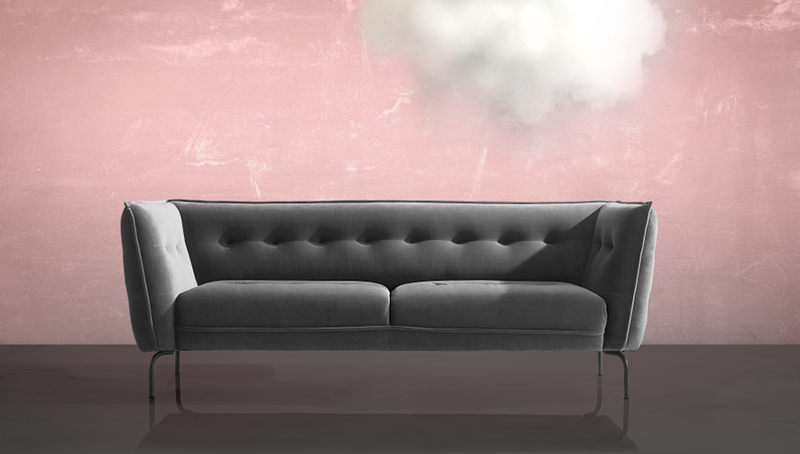 ASOLO 3 seat sofa in Super velvet 2376 Silver Grey and black metal legs, designed by Ashkan Heydari, L230 x W84 cm. 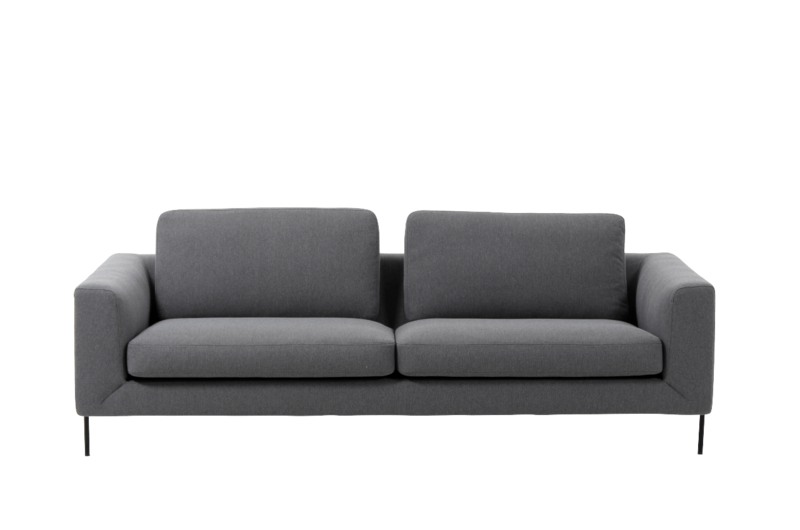 2 Seater sofa, in Saphire grey fabric,designed by Says Who, L187 x W94 x H81 cm. 2 Seater sofa with corner, open end and chaiselong in fabric Side 05 beige, L336 x W220 x H80 cm. COFFEE table 60 in white marble, black metal legs, L62 x W62 x H43 cm. 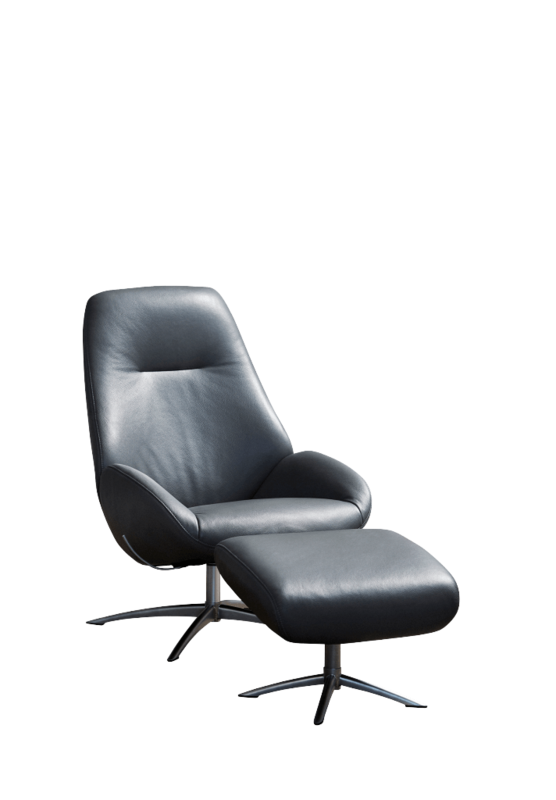 1426 Recliner Semianiline black, 374 L86 x W77 x H78 cm. Coffee table with glass table top with marble look and gold colored base, D80 x H45 cm. 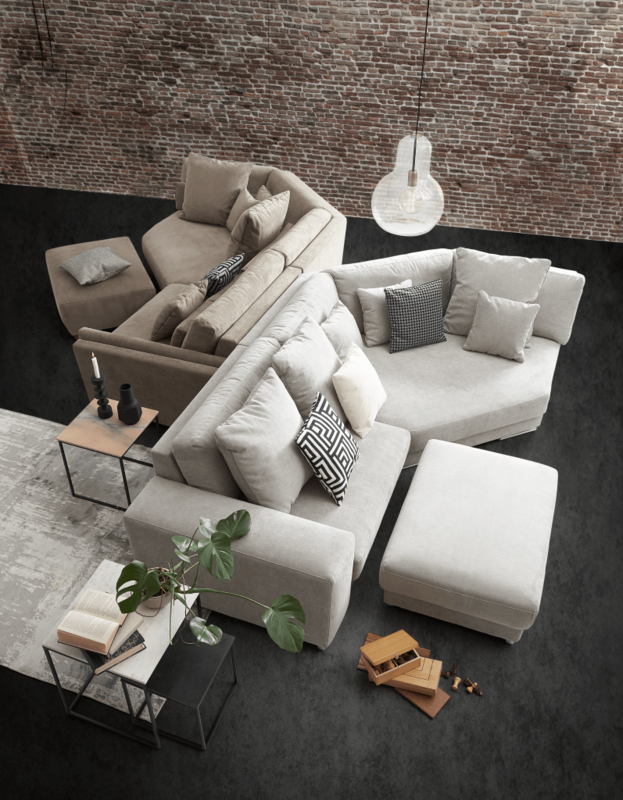 FLORIDA modular sofa in 2 versions, 2 different armrests and fronts, Fabric Praque 2562 grey and Praque 2560 brown, grey version: L272 x W248 x H81 cm, brown version L272 x W248 x H81 cm. 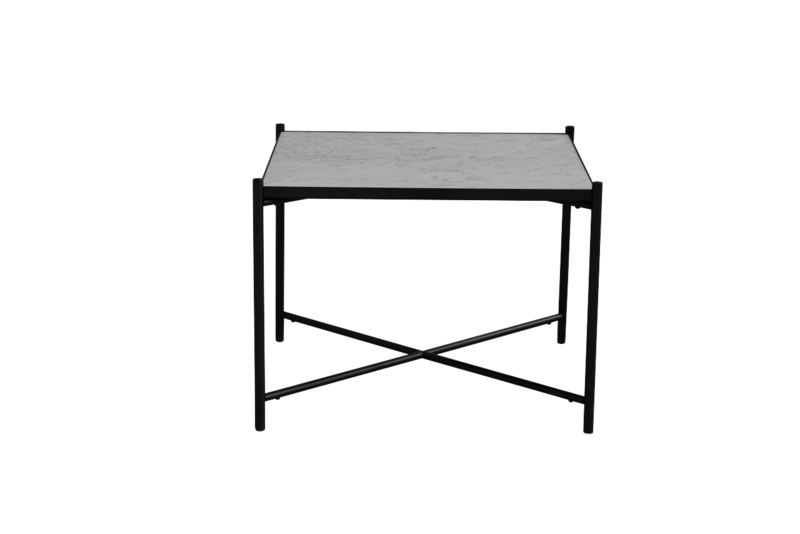 HOME side table with black metal frame and black marble top, W34 x D34 x H36 cm. HOME side table with black metal frame and rose marble top, W40 x D40 x H44 cm. HOME side table with black metal frame and white marble top, W46 x D46 x H52 cm. STELLA sofa with a corner in Yeti fabric color natur, L342 x W187 x 102 cm. LOVE coffee table in oiled oak or grey, D40 x H52 cm, more colors and sizes are available.